2002-08-13 Assigned to SMARTPIPES, INCORPORATED reassignment SMARTPIPES, INCORPORATED ASSIGNMENT OF ASSIGNORS INTEREST (SEE DOCUMENT FOR DETAILS). Assignors: BELL, RAYMOND J., BEADLES, MARK A., EMERICK, WILLIAM S., MULH, KENNETH E., RUSSO, KEVIN A. 2003-03-21 Assigned to SMARTPIPES, INC. reassignment SMARTPIPES, INC. CHANGE OF NAME AND ADDRESS IN RECORDED ASSIGNMENT Assignors: SMARTPIPES, INC.
2006-09-22 Assigned to ENDFORCE, INC. reassignment ENDFORCE, INC. CHANGE OF NAME (SEE DOCUMENT FOR DETAILS). Assignors: SMARTPIPES, INC.
2009-08-13 Assigned to SOPHOS, INC. reassignment SOPHOS, INC. MERGER (SEE DOCUMENT FOR DETAILS). Assignors: ENDFORCE, INC.
2009-08-19 Assigned to SOPHOS PLC reassignment SOPHOS PLC SHARE CERTIFICATE Assignors: SOPHOS, INC.
2014-01-24 First worldwide family litigation filed litigation Critical https://patents.darts-ip.com/?family=27668347&utm_source=google_patent&utm_medium=platform_link&utm_campaign=public_patent_search&patent=US20030154404(A1) "Global patent litigation dataset” by Darts-ip is licensed under a Creative Commons Attribution 4.0 International License. A policy engine in a policy-based, outsourced, network management system. In one embodiment, the management system is multi-layered, modular and stores device configuration data in non-device specific format, which are subsequently translated to device-specific format by lower layers of the management system. The non-device specific format is the same (e.g., XML) as that used to create the policies with the user GUI (e.g., browser) and transport them to the service center over the internet. A database stores a policy directory in a hierarchical format that is separate from a policy store (configuration store) for devices in a flat (non-hierarchical or parallel) format. 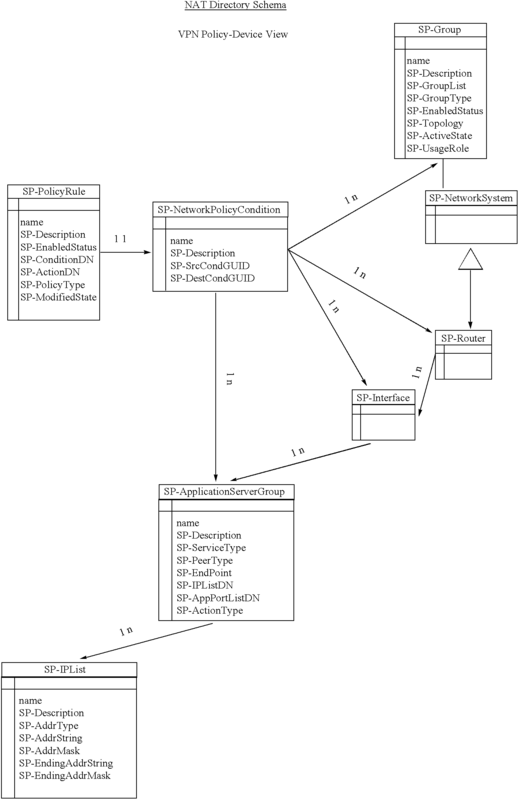 In one embodiment, a policy engine develops policies in a hierarchical format, but then stores the device schema, or objects, in a low-level, flat database. Multiple hierarchical services which impact a single device have the characteristics related to that device knitted together, and then fed back to a policy store database as a flat file for that device, in a non-device specific format. Thus, instead of storing the policies separately, and in hierarchical linked format, the device descriptions are stored with the aspects of all policies that affect that device. 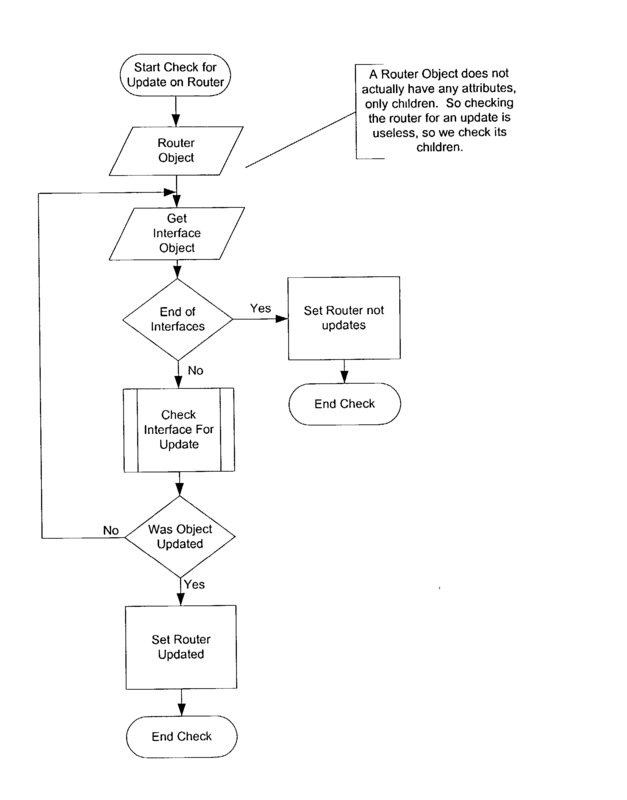 This application is related to copending application Ser. No. ______, “Selection And Storage Of Policies In Network Management” (Attorney Docket No. 20063P-001210US), Ser. No. 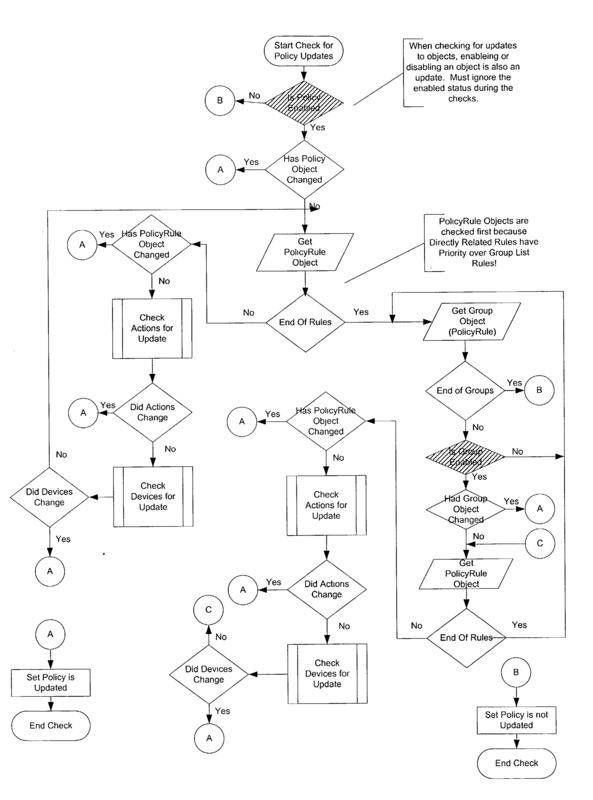 ______, “Event Management For A Remote Network Policy Management System” (Attorney Docket No. 20063P-001410US), Ser. No. ______, “Device Plug-In System For Configuring Network Devices Over A Public Network” (Attorney Docket No. 20063P-001510US) and Ser. No. ______, “Modular Remote Network Policy Management System” (Attorney Docket No. 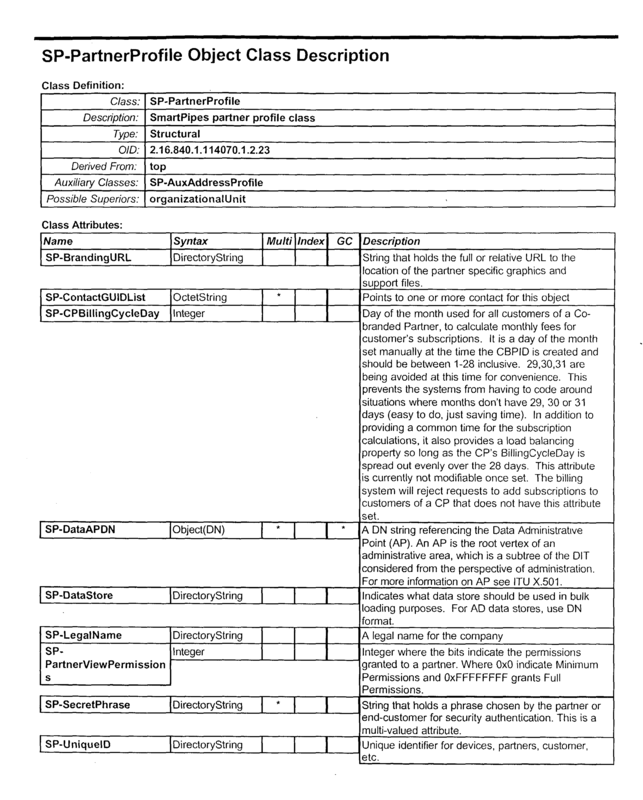 20063P-001610US), all filed even date herewith and assigned to the same assignee, and all incorporated herein by reference. In one embodiment, the policy generator is implemented with a main thread and a policy generation thread pool. The main thread spawns the other threads. Each thread in the thread pool is responsible for policy for a particular policy object. The main thread maintains an ActiveX® Data Objects (ADO) pool, which provides an application level interface to an OLEDB provider (a set of interfaces to the configuration store). FIGS. 1A-1F show a client network communications system being managed by the policy-based network management system, in accordance with one embodiment of the present invention. FIG. 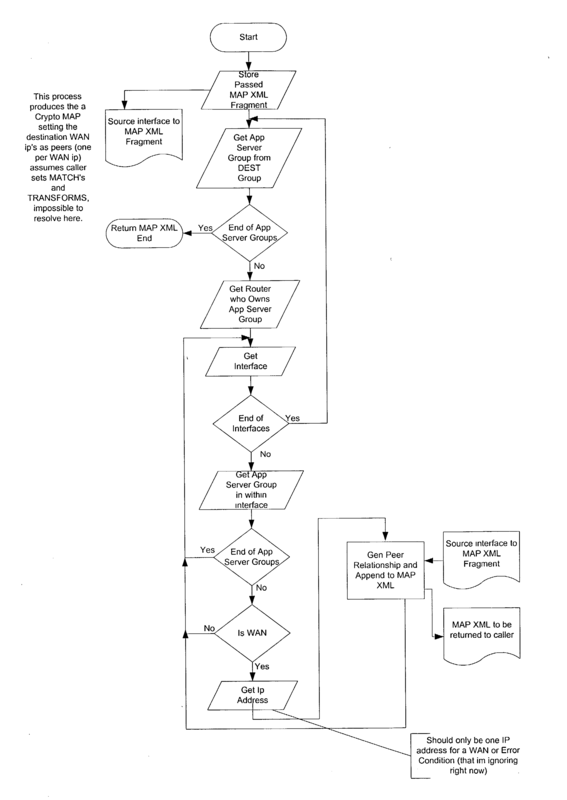 7 is a flow chart illustrating the operation of an example PSA, the VPN PSA. The present invention provides policy-based outsourced network management system at a service center and thus manages and controls a communication network having multiple network device types over a network (e.g., the internet). The management of a typical communications system by the outsourced management system of the present invention is briefly shown in FIGS. 1A-1F, described below. FIG. 1A shows a customer communications network  20 (shown inside the dashed perimeter lines and composed of network service points 22, 24, 26 and 28) that is coupled to the management system 10 via internet 30. Each network service point may include a number of network devices, such as routers, hubs, printers, facsimile machines, computer systems, etc. In FIG. 1A, internet 30 is shown as the communications medium via which customer 32 using his computer system 34 communicates with management system 10. 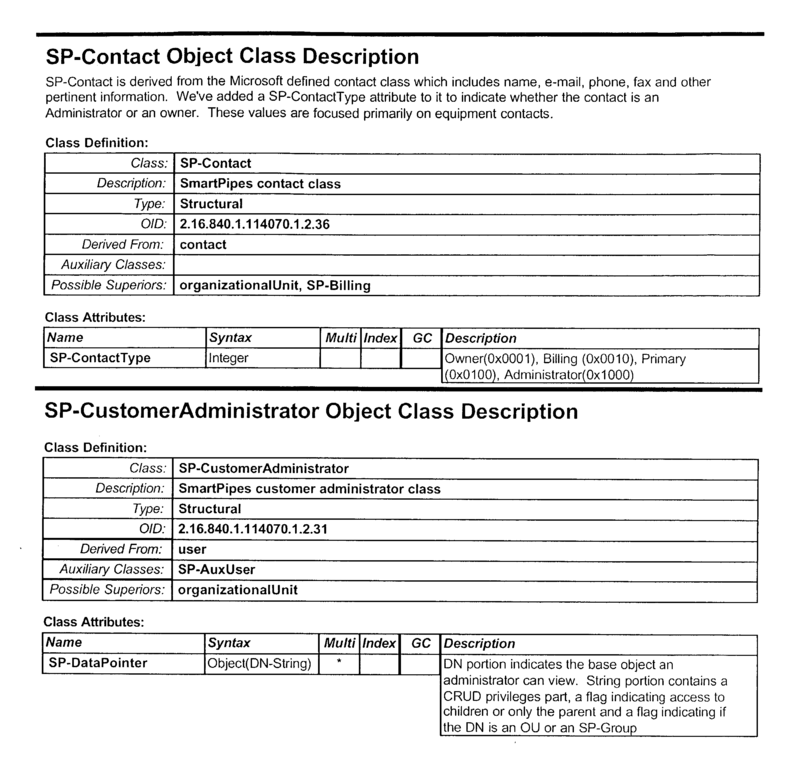 The customer's devices are stored as objects in the management system 10. Next, as shown in simplified FIG. 1B, the customer describes intranet and extranet policies for configuring the network communications system  20 under the control and management of system 10. Customer 32 uses a graphical user interface (GUI) on his/her computer system 34, such as an internet browser. The customer describes network policies using the browser, then provides them over the internet to management system 10. Next, as shown in simplified FIG. 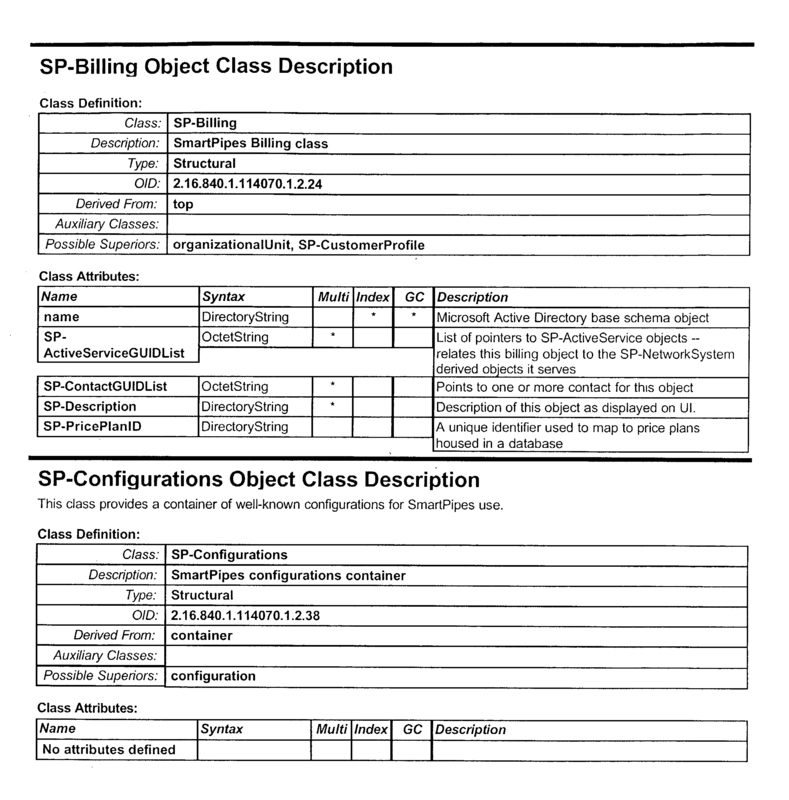 1C, system  10 interprets and converts the selected network policies to device-level configuration data and stores the configuration data in a directory. Next, as shown in simplified FIG. 1D, system  10 via the internet 30 and using a secure channel, applies the selected intranet and extranet policies to configure the network devices disposed in each of the network service points 22, 24, 26, and 28 to thereby bring the communication network 20 under its control. FIG. 1E shows that the system  10 has completed configuration of communications network 20, which therefore may carry out its intranet and extranet policies in accordance with the adopted policies. FIG. 1F shows that after configuring the network devices and applying the network policies, system  10 continues to monitor and manage network communications system 20 via internet 30. FIGS. 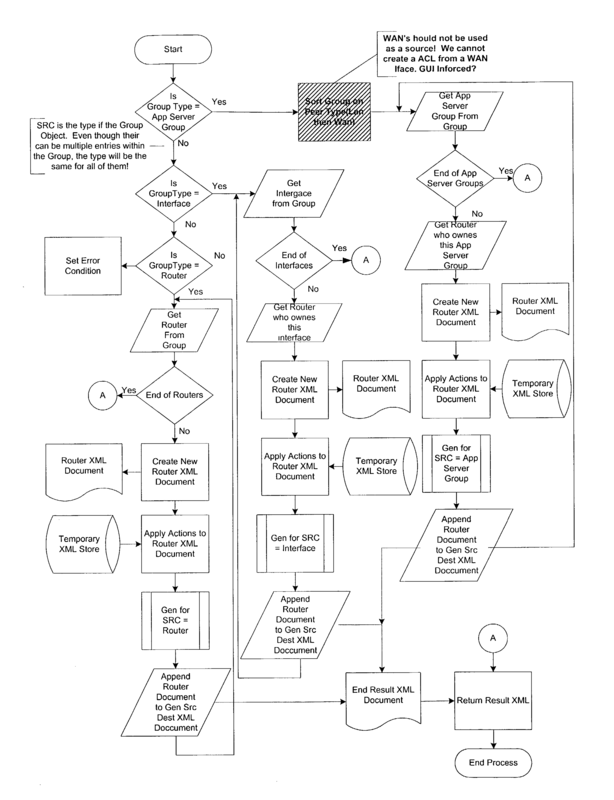 2A and 2B show simplified block diagrams of various layers of management system  10 of FIGS. 1A-1F, in accordance with one embodiment of the present invention. System 10 operates in accordance with a global policy service architecture and includes seven layers, namely, a client layer 100, a presentation layer 200, a logic layer 300, a data layer 400, a policy layer 500, a device plug-in layer 600 and a managed devices layer 700. System 10, also includes, among other modules, an event manager 32 and a device monitoring system 35. System 10 configures, monitors, and controls (i.e., manages) network devices, such as Cisco router 710 and Windows IP Services Gateway 720—in managed devices layer 700—via the internet 31. System  10 provides a framework for describing internet protocol (IP) services by adopting network policies and managing the network devices (hereinbelow alternatively referred to as managed devices) in layer 700, in accordance with the adopted policies. System 10 is a data-center-based service architecture composed of an array of interacting software, network, and data store elements. System 10 is a dynamic, multi-layered, distributed architecture, and is secure and expandable. To configure a network device and select and deploy network policies, a user first supplies information regarding his/her network devices (such as the devices' types, model numbers, IP addresses, base configuration data), as well other administrative information (e.g., a contact person at the user's company) to system  10 in one of the following two ways. The user may identify his/her network devices graphically and via an internet browser from various lists that system 10 displays to the user. 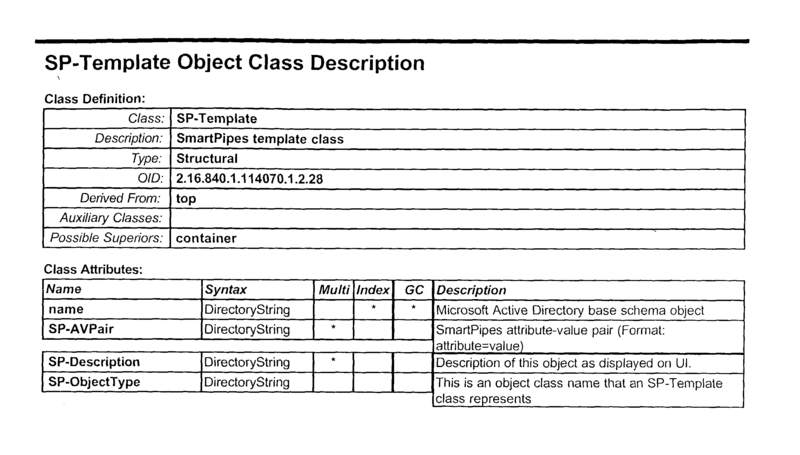 System 10 collects the user data so identified and stores them in an XML file. Alternatively, the user may create an XML file containing such network identification data and transport that XML file directly to system 10 via the internet. It is understood that when a communication medium other than the internet is used, the user uses a GUI other than an internet browser and may use a file format other than the XML format. It is also understood that the user may create a file using a format other than the XML and which is directly viewable and transportable over the internet. The XML data identifying network devices—supplied by either of the above two methods—is subsequently converted to hierarchical data and written to an Active DirectoryTM 440. Next, using a web browser, the user navigates through various policy lists—displayed to the user by system  10—from which lists the user selects and deploys network policies. The selected policy data are stored in Active DirectoryTM 440. Next, a policy engine in policy layer 500 retrieves policy data stored hierarchically in the Active DirectoryTM 440, knits different service-based policies together, converts the knitted policies from hierarchical to flat XML format, and thereafter stores the XML policy data which are service-based and device-neutral in policy store 430. Subsequently, an associated device plug-in residing in device plug-in layer 600 of system 10 receives the XML data—stored in the policy store—via the policy engine, translates the XML data to device-specific configuration data and, thereafter, transfers the device-specific configuration data to its associated network device thereby to configure the device and deploy the policies. Data Layer  400 in FIG. 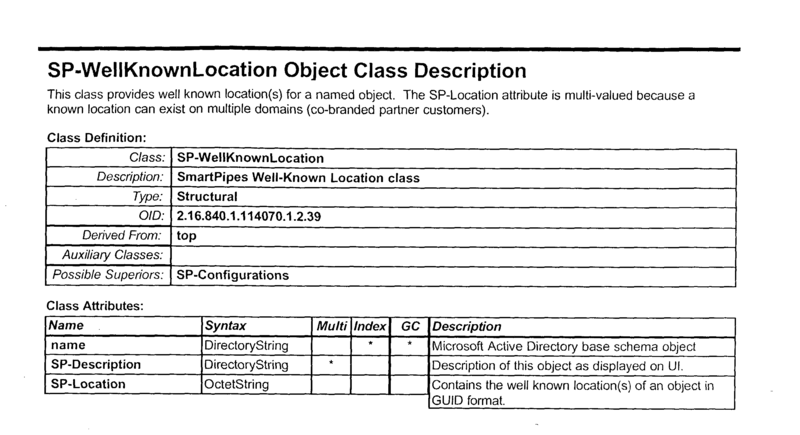 2A includes an active directory 440, a policy store 430, and SQS store 420, and an audit store 410. The present invention uniquely provides a hierarchical policy representation and directory 440, which is then translated and stored in a per-device flat file format in policy store 430. The policy store, like the other databases, is implemented as a Microsoft SQL server database. The policy store consists of clustered, replicated, optimized SQL server databases. It fulfills requests from policy engine  500 to store, retrieve and maintain versions of policies in managed device base configurations in a distributed database. Network policy is stored on a per-device basis in an Extensible Mark-Up Language (XML) format. Information stored for each policy and base configuration is versioned and time-data stamped. XML policy instantiations are stored in the policy store  430 using XML schema from the directory 440, described below. 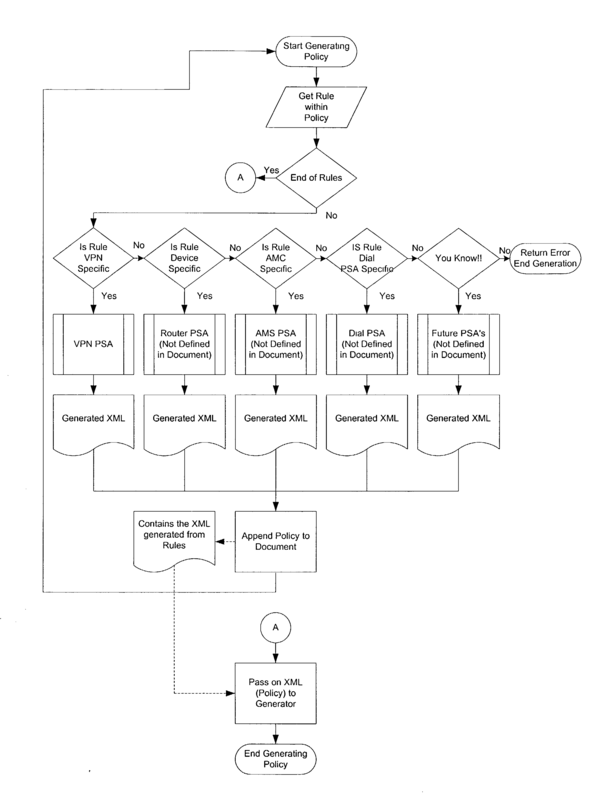 This schema contains tags and elements describing IP services policy, including managed device policy, IPS EC policy, firewall and NAT policy, and policy for all other managed IP services. The audit store contains data and tracks user activity in SAI logic tier  310 for the purpose of auditing. 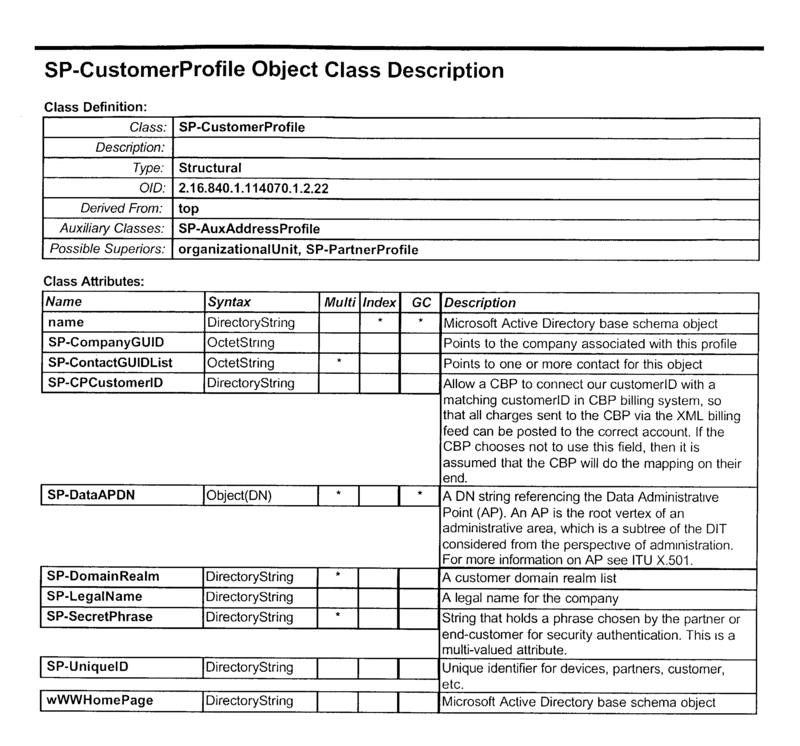 Examples of the kind of data stored are which object was accessed, what type of action was performed on that object, what associated objects were affected, and time and data information. The audit store consists of clustered, replicated SQL server databases. Directory  440 in data layer 400 is the main store for all data related to network infrastructure, users, managed devices, applications, and policy data. 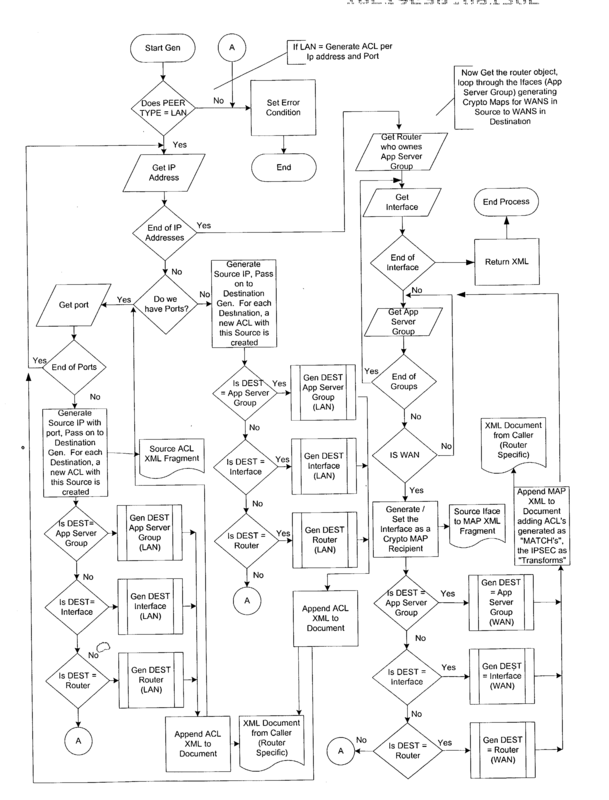 Directory 430 is based on Active Directory™ schema incorporating the X.500 and DMTF DEN/CIM standard schema, as well as a number of network-adapted schema extensions according to the present invention, attached as Appendix A and as described below. Access to the directory 440 is made via either LDAPv3 or Active Directory Service Interfaces (ADSI). The hierarchical data stored in directory 440 establishes policy relationships between various entities of system 10. Directory  440 is a single directory containing multiple domain trees of two types, namely an infrastructure domain type 442 and a customer domain type 444. Infrastructure-type domain 442 store non-company specific data such as customer profiles, billing information, standard intranet applications, managed device types and models, standard policy rule sets, standard VPN security templates, supported software versions. Customer-type domains  444 store company-specific data such as company authentication realms, network users of the company, service groups, managed devices, custom applications, network interfaces, telecommuters and groups, business networking policies, policy conditions, custom VPN security templates, custom policy actions, pointers to managed device base configurations stored in the policy store 430. Hierarchical Data stored in the directory 440 is retrieved and converted to device-neutral XML service-based data by policy engine 510 and is subsequently stored in policy store 430. Policy engine layer  500 forms the fifth layer of system 10 and contains a policy engine 510, which in turn, includes a policy generator 520, a number of policy service agents (PSA) 530, a policy fetcher 540, an authentication/key manager 550, and a status tracking system 560. The Policy Generator  520, acting with each of the Policy Service Agents (PSAs) (below), is responsible for generation, normalization, and versioning of per-device XML-based network policy instantiations, and for storing the resulting XML data in the Policy Stores 430. The generation process is triggered by receipt of a policy change event from the Event Manager 32. After storing new network policy for a Managed Device, the Generator sends notification to the appropriate Device Plug-In via the Event Manager. Policy Service Agents (PSAs) are distinct elements that operate in conjunction with the Policy Generator. Each PSA is responsible for interpreting a set of policy Schema in the Director  440, and generating per-device XML-based network policy instantiations based on the business-networking policy in the directory. Each PSA corresponds to an individual abstracted network service, for example an IPSec VPN service and a Firewall service. 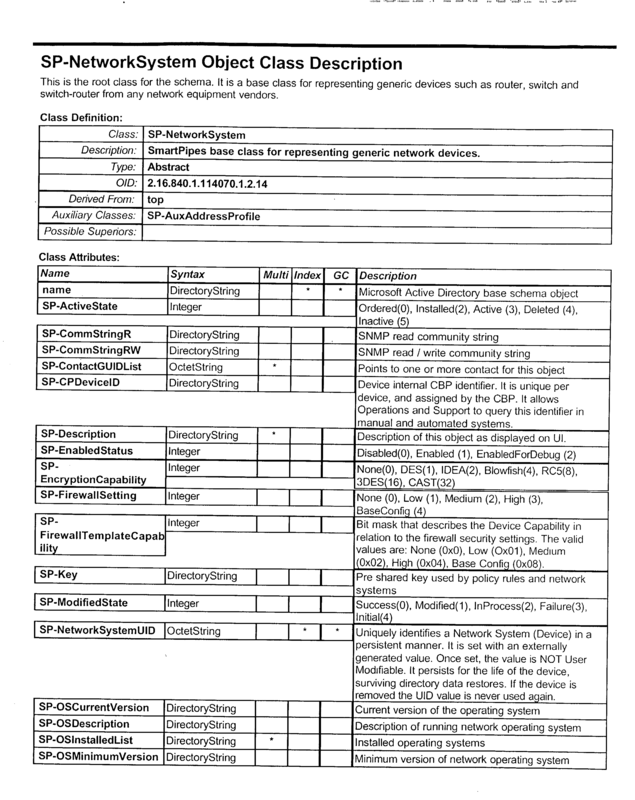 As new services are added, a new PSA is developed (based on a PSA framework) to interpret and generate network policy for that new service. FIG. 3 illustrates the policy generator of the present invention on multiple servers. Shown is a first instantiation of the policy generator on a first server  50, a second instantiation on a second server 52, and an Nth instantiation on an Nth server 54. The policy generators on these different servers are controlled by event manager 32, which may be on a different server, or on one of servers 50, 52 or 54. All the servers connect to a database on a memory system 56, which may be a RAID array or other memory. The event manager can divide up the policy generation tasks for a single customer between the multiple instantiations of the policy generator, or can divide up the policy generation by customer so that a single customer has the policy generated by the same instantiation of the policy generator. (1) Policy Rules are provided from directory  440 to policy generator 520. (4) the parsed policies are provided to PSAs  530-1, 530-2, etc. The provided policies include the rule description, the server address (which of the servers of FIG. 3), and an XML template. 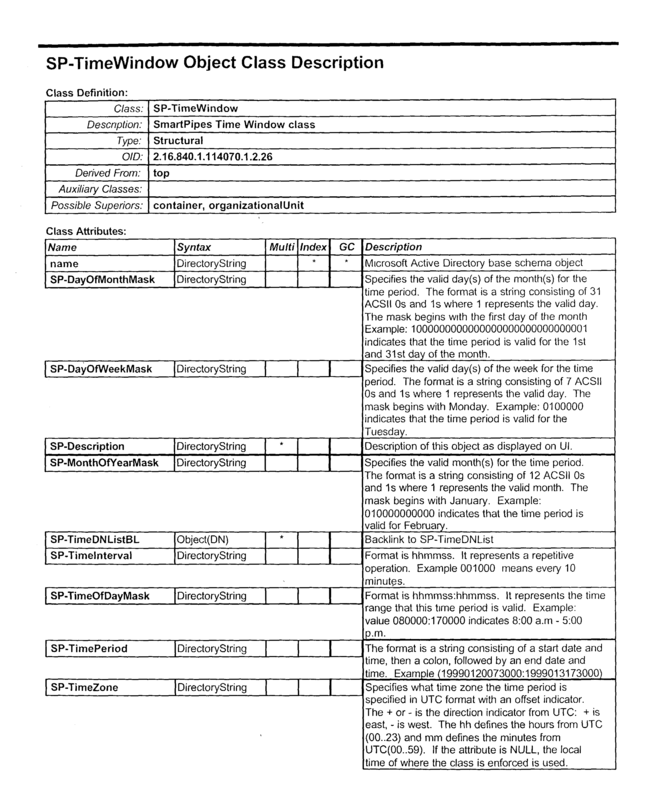 (5) The PSAs query directory  440 for the information needed, and assemble device-level policy descriptions which are populated into the provided XML template. (6) The populated XML template is provided back to policy generator  520. 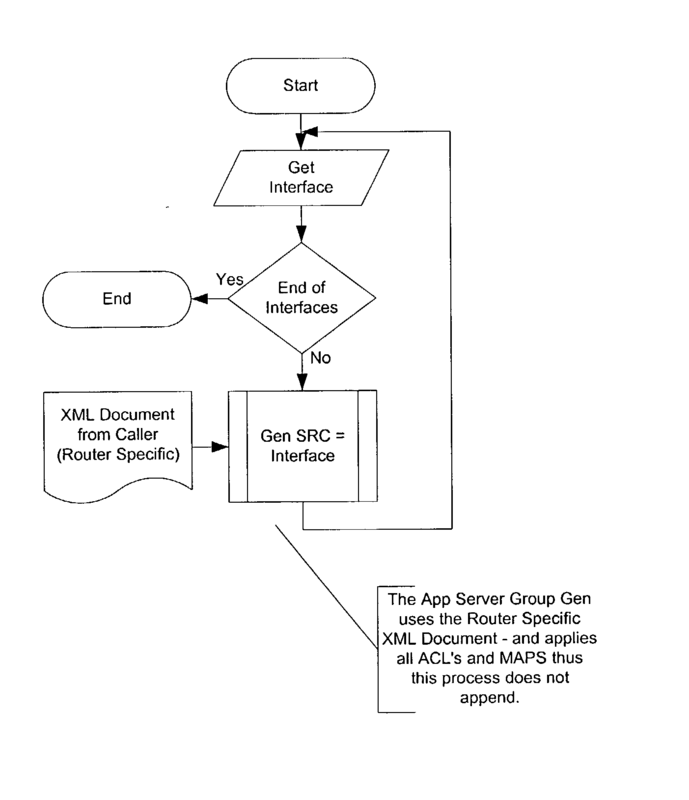 (7) The policy generator uses an XSL style sheet to concatenate together the XML templates on a per-device basis. 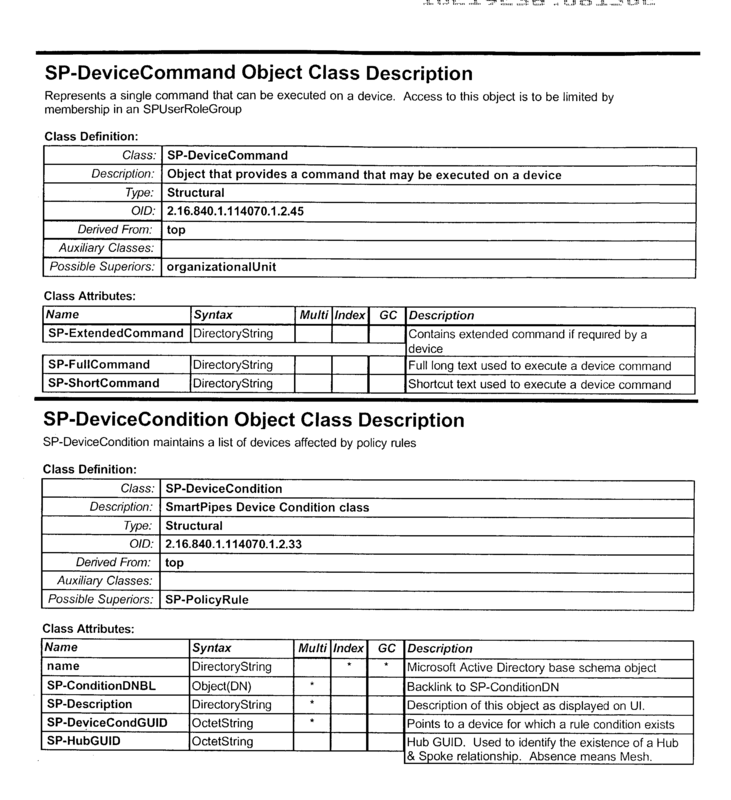 In addition, the device attributes previously obtained from directory  440 are appended. (8) An XML document for each device is then provided to policy (configuration) store  430. FIG. 5 illustrates the use of threads by the policy generator, and more details on the interface to the configuration store. In particular, policy generator  520 interfaces with the event manager 32 through an event manager Application Program Interface (API) 570. The policy generator includes a main thread 572, which spawns a policy generation thread pool 574. A particular policy generation thread 576 in thread pool 574 is shown. Thread 576 includes a received event thread 578 which is used to receive a policy change/create event. Thread 576 then establishes communication with the appropriate one of the PSAs, such as VPN PSA 530-1 or AMS PSA 530-4. 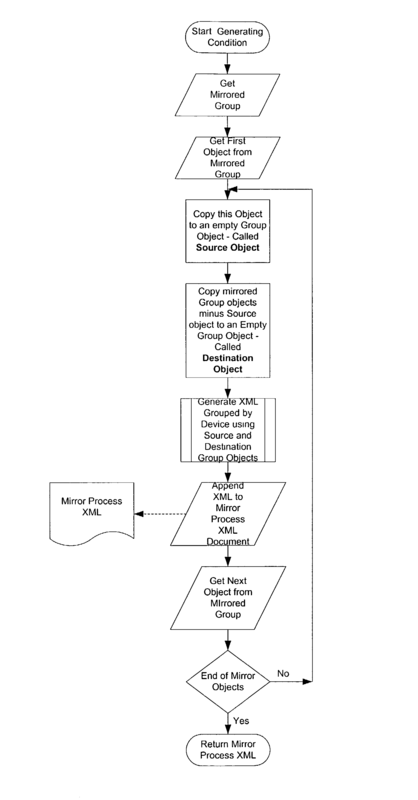 Communication, as needed, is provided with the directory 440 illustrated as an MS XML DOM object which provides a tree view of the XML documents. A registry  580 under control of a run-time values thread 582 registers the different PSAs, and provides a mechanism for adding a new PSA. A Windows service control manager (SCM) 584 tracks the status of thread execution through an SCM status thread 586. 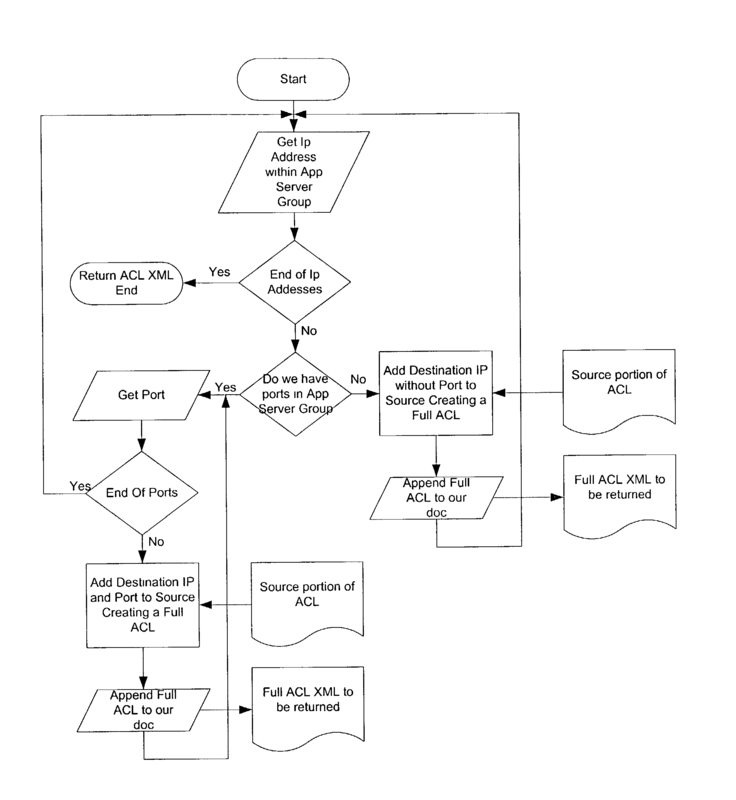 An ActiveX® DO(ADO) connection object pool  588 is provided in main thread 572. This connects to an ADO connection object 590 which provides an application level interface to OLEDB provider 592. The SQL OLEDB provider is a set of interfaces to configuration store 430. The SCM  584 ensures that the policy generator 520 starts when system 10 boots up. The SCM also provides an interface to SAI 220 to stop the service if necessary. Policy generator 520, in cooperation with the PSAs, generates, versions, and stores in policy store 430, device-neutral policies on a device-by-device basis. After storing new policy for a device, policy generator 520 notifies an associated DPI Device that a policy has been generated. (1) Receive notification from the SAI  220 via event manager 32 that policy has been changed in directory 440 and thus must be regenerated. 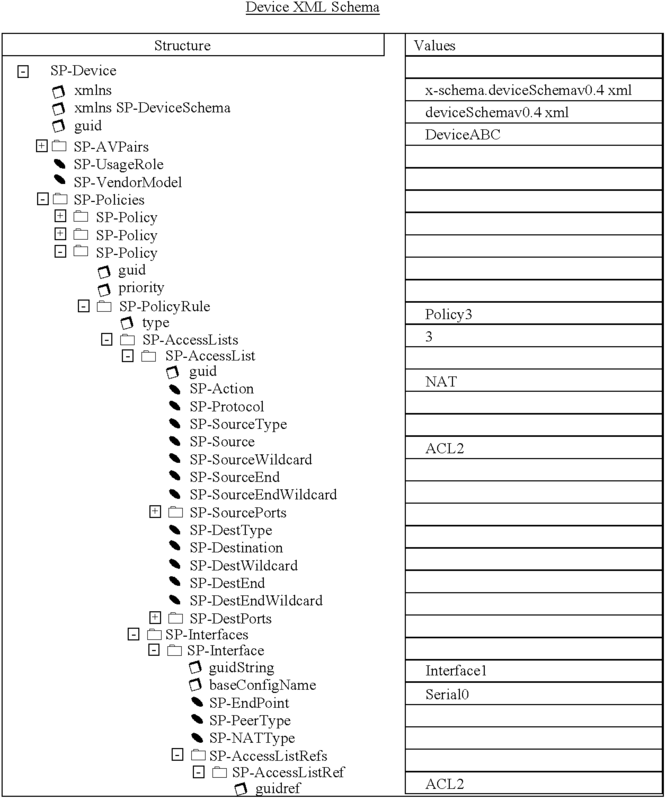 (4) Store and version each device-specific policy representation in policy store  430. (5) Notify the associated DPI via event manager  32 that there has been a policy change. Main thread  572 is responsible for spawning all other threads and performs all initialization sequences such as registering with the SCM. The main thread, also serves as the message pump for any COM objects that are used or implemented by the other threads. The policy generation thread pool  574 is a pool of worker threads. Each thread is responsible for receiving policy generation events from the event manager 32 and, in response, generating a policy for the object specified in the event. The size of the pool is configurable via registry settings. Policy generator enables connection pooling at the OLEDB provider level, thereby allowing the physical connections between the policy generator  520 and the database server to be reused. Since the act of setting up a physical connection to the database server can be prohibitively slow, connection pooling provides a huge cost savings. 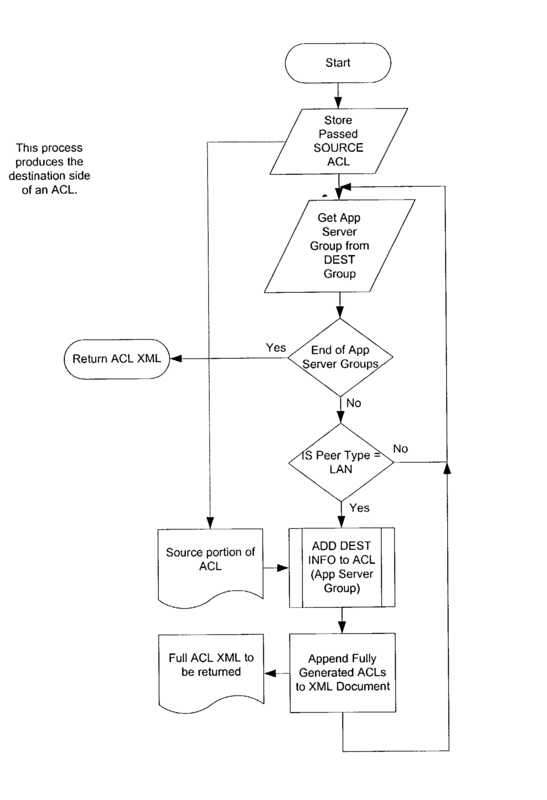 Secondly, it is quite expensive to recreate ADO Connection objects again and again. So, using a pool of pre-created ADO Connection objects can greatly improve performance. Policy generator  520 uses ADO's Command object to define all parameters necessary to call the stored procedure to, thereby, avoid multiple round trips between policy generator 520 and the database server which would otherwise be required to determine the types and sizes of parameters. The use of ADO's command by policy generator 520 results in system performance improvement. A cluster of SQL Servers house policy store  430 in order to support fault tolerance. Policy generator 520 accesses policy store 540 via a “virtual” database server provided by the SQL Server cluster to facilitate database fault tolerance. A Policy change event may signal that policy has changed either at an organizational unit (OU) object level or a policy object level. 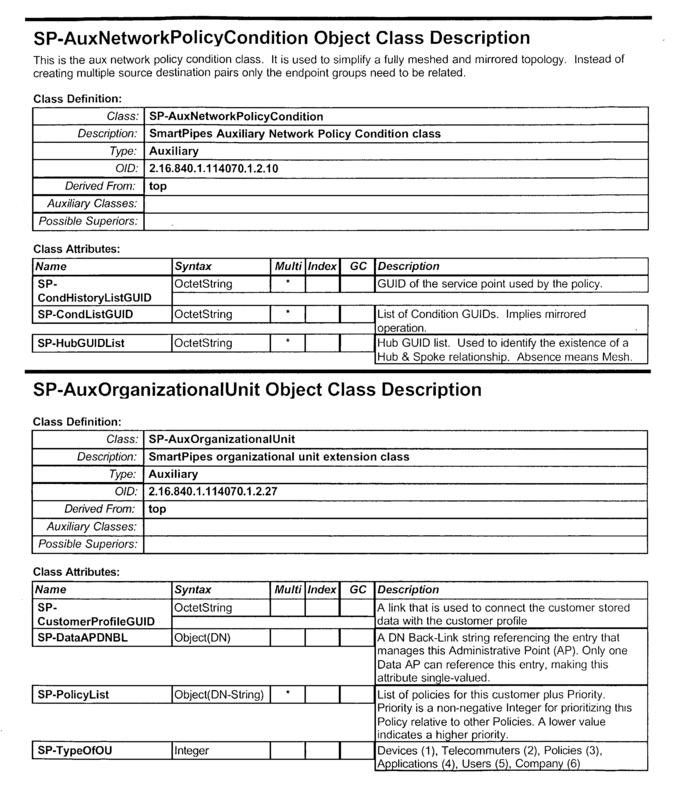 If it is at the OU object level, the policy generator  520 determines all of the policies contained within the OU object and then generates XML policy schema for each. Each policy generation thread treats an event as its unit of work. Since a single thread is coordinating policy generation for a single event, policy generator 520 generates XML policy schema serially for each policy object beneath an OU object. 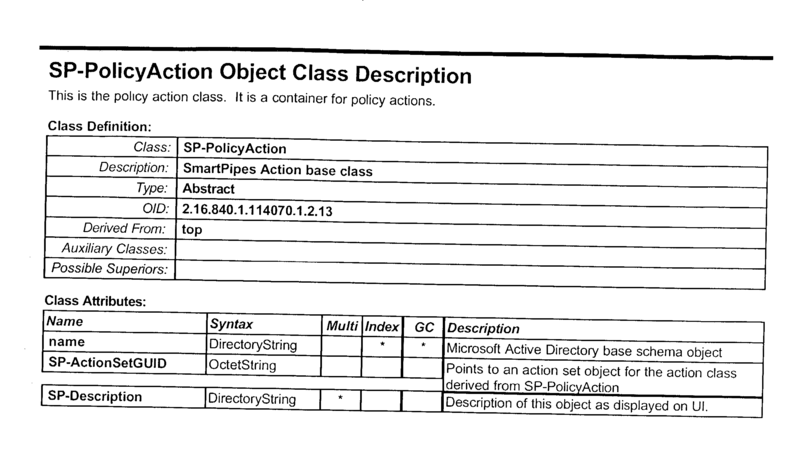 Alternatively, XML policy schema for all policy objects may be generated in parallel. Each policy object is made up of one or more policy rule objects. 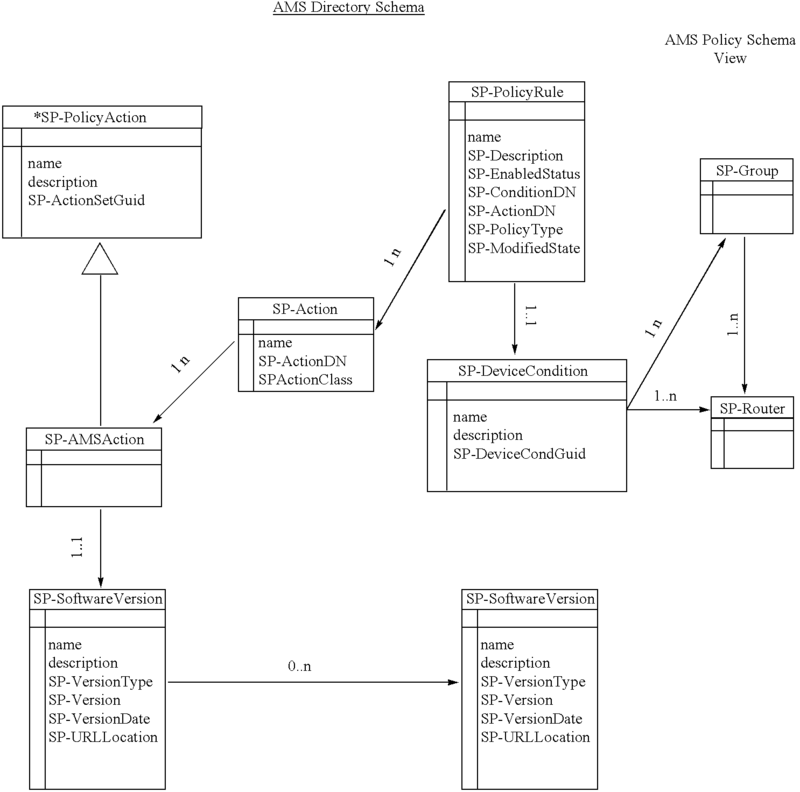 Each PSA generates XML policy schema for a given policy rule object. 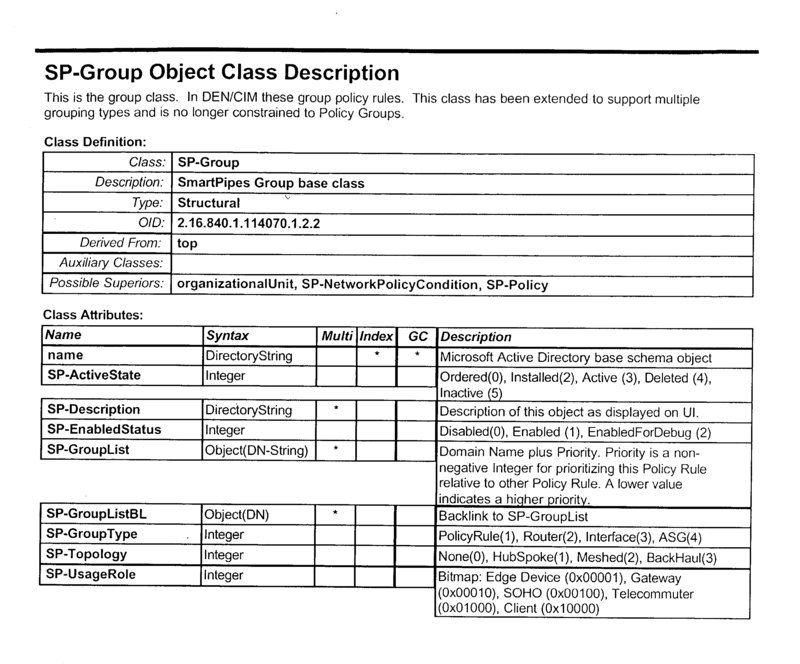 Policy generator  540 determines the policy rules included in the policy object by querying the directory 440. Each rule has an associated rule type that defines a policy service type(s). For example, a policy may contain a VPN rule and a QoS rule. Each PSA registers with policy generator  540 the type of policy rule it is able to generate (see “Configuring a New PSA” section below). Policy generator 540 matches the rule type to the corresponding PSA that is able to generate XML policy schema for that rule. 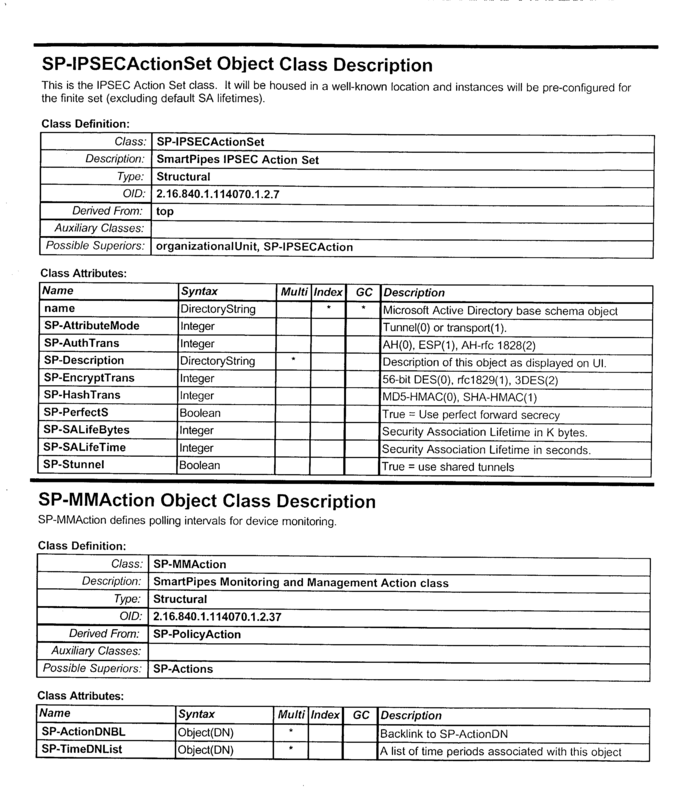 Each PSA, using its registration information, creates an instance of the PSA object, queries for the ISPGeneratePolicy interface, and calls the GenerateXMLSchema method. 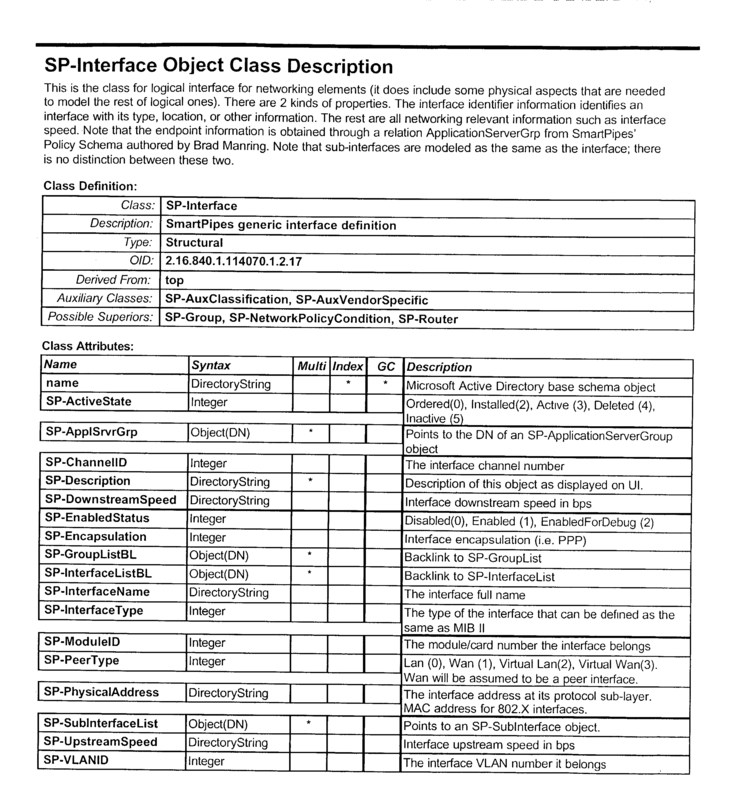 Accordingly, there is a PSA object instance per policy rule object. There are multiple types of XML schemas. 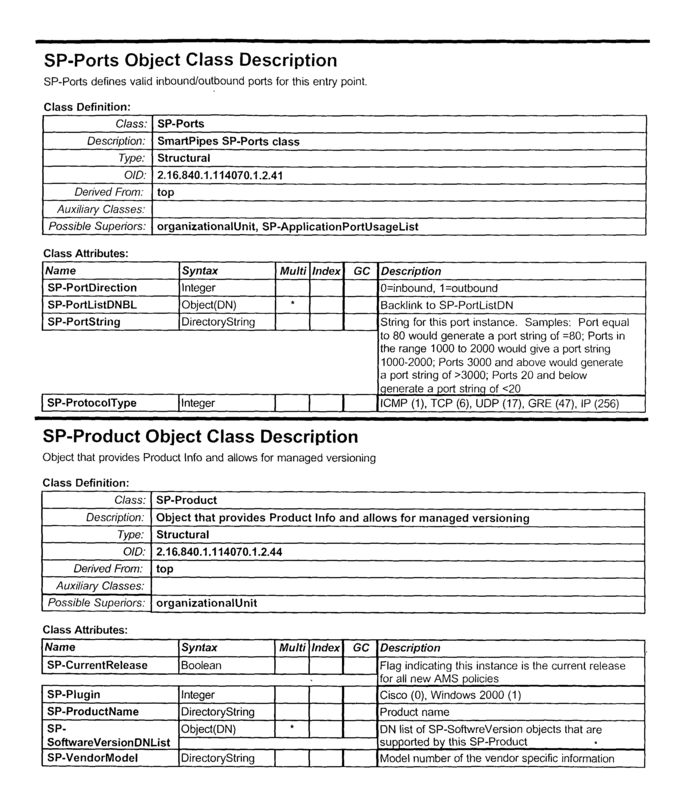 One is the device schema which is stored in policy store  430. Another is a VPN policy rule schema which is populated by the VPN PSA and is returned to policy generator 540. 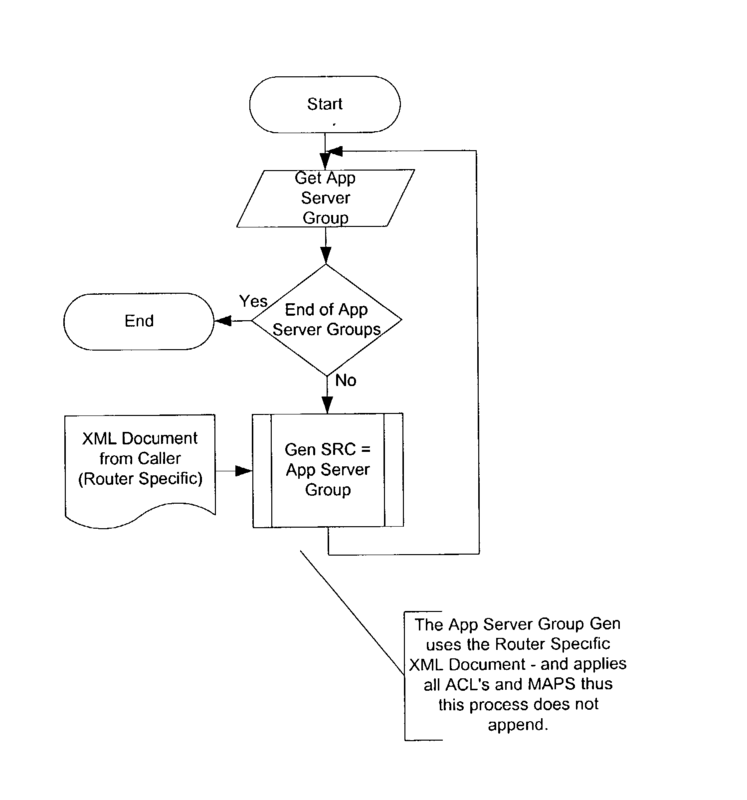 After the policy generation thread retrieves the XML document created by each PSA, the XML policy rule documents are concatenated and placed into a collection of device-specific XML documents using XSL stylesheets. To achieve this, first policy generator  540 applies an XSL stylesheet to the document to sort it by device. Next, policy generator 540 applies an XSL stylesheet to merge data. Next, using another XSL stylesheet, policy generator 540 normalizes out any duplicate data. Next, using the final XSL stylesheet, policy generator 540 creates new device-level XML documents as defined by the XML device schema definition above. If only a single policy is stored (i.e., the policy generation event contains a Policy DN not an OU), policy generator  540 retrieves the active policy for the device from policy store 540 and use it as the basis for the new version of XML. Once the XML is retrieved from policy store 540, policy generator 540 merges the newly generated policy schema into the existing policies. To achieve this, policy generator 540 first concatenates the old and new policy schemas. 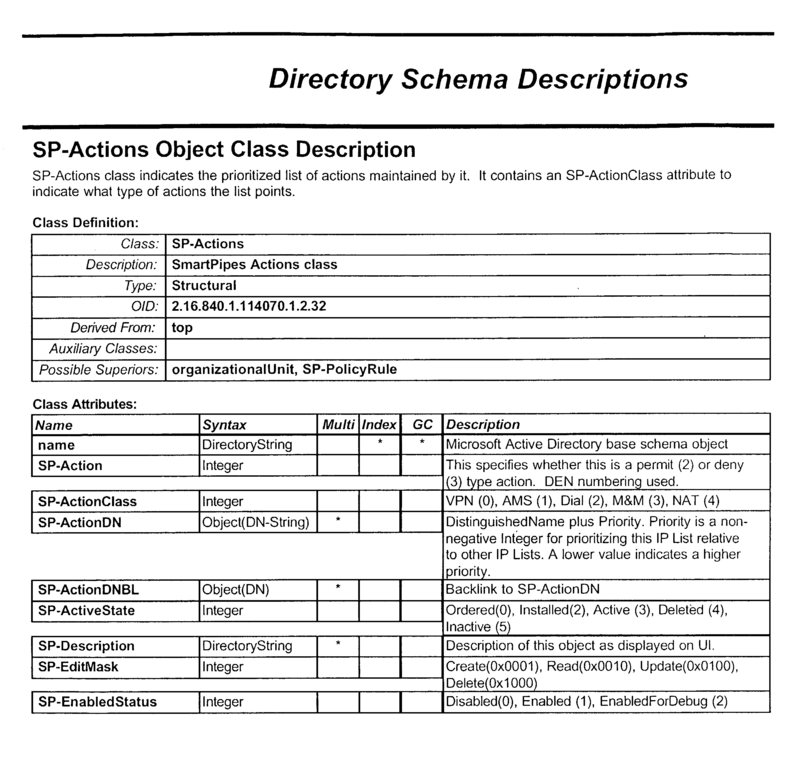 Next, it uses an XSL stylesheet to replace the old policy with the new policy using the identifier attributes on the XML entities as its keys, for example, policy generator 540 uses the baseConfigName attribute on the SP-Interface entity, the mini-GUID attribute on SP-IKE policy entity and the DN attribute on SP-IPSEC policy entity to match the two policies. Each device-level XML document is versioned and stored in policy store  430. The policy generator 540 creates a new row for each device-level XML document in the Policy Store's policy table in accordance with the table below. policyVersionGUID The database server will generate a unique value. deviceGUID GUID of the device object in the Directory. createDate Column's default value which is current date. status Status will be Active. statusDate Column's default value which is current date. replication. The value passed to Policy table. Policy generator  540 receives an available Connection object from the ADO Connection object pool to execute the required SQL commands on the server. To change the policy for a device, policy generator 540 first changes to inactive the status of the policy of an active device and, thereafter, inserts the new policy as the active policy for the device. The change and insert are done within a transaction so that either both or neither of the changes are committed within the transaction to ensure that there is only one active policy per device at a time. Policy generator  540 uses the event manager interface, to send a policy generation event for each device that it generates a new policy. 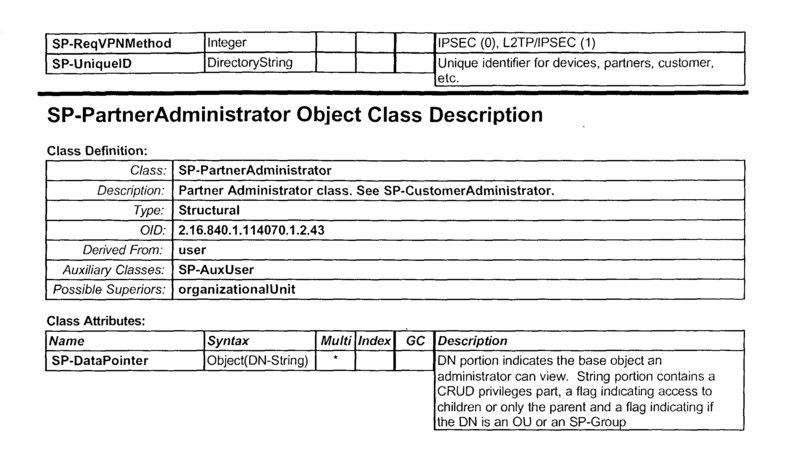 Each device object in the directory 440 has a type attribute, furthermore, each DPI in layer 600 communicates policy data to one or more device types (e.g., a Cisco Router, a Win2K Edge device). Depending on the device type, policy generator 540 generates an event of a specific type (i.e., policy change for Cisco router) and sends the event to event manager 32 using the event manager interface. Each device plug-in in layer 600 must register with event manager 32 in order to receive an associated event type. Therefore, a device plug-in is notified of a policy changes only for such devices that it is configured to communicate with. Policy generator operates in conjunction with the PSAs and therefore is notified when a new PSA becomes available. A PSA is added to policy generator  540's list of known PSAs without any code change to policy generator 540. Moreover, the addition of a new PSA to policy generator 540 does not require a restart of the policy generator 540 (“hot add”). The following is the list of registry entries that must be made by a PSA in order to be registered with policy generator  540. CLSID REG_SZ The Class ID of the PSA component. Policy Rule Type REG_DWORD The type of policy rule that this PSA can process. 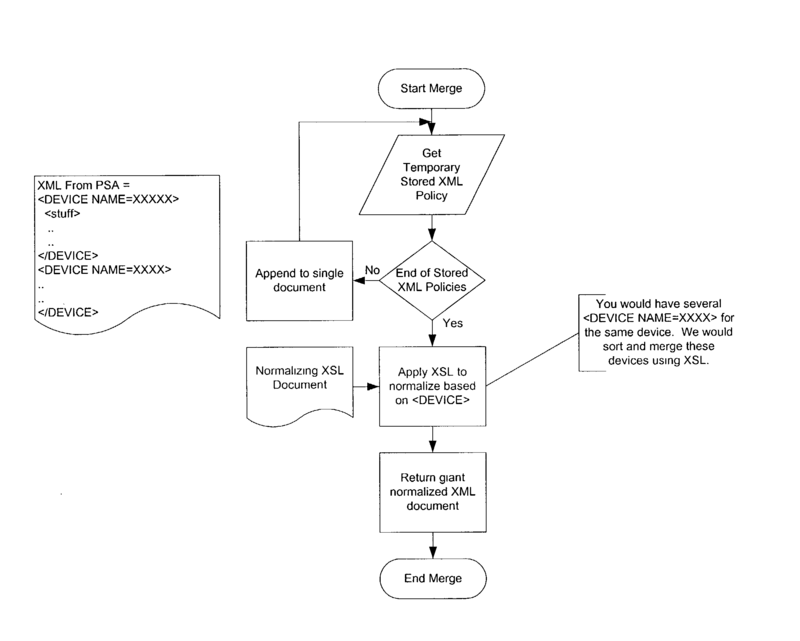 As described above, upon receiving a policy change request from event manager  36, policy generator engine 520 retrieves and, in conjunction with the PSAs, converts hierarchical network policy descriptions stored in the policy schema of directory 440 to service-based, device-neutral XML policy data, and subsequently store the converted data in policy store 430. Four such PSAs, namely a VPN PSA  530_1, a NAT PSA 530_2, a firewall PSA 530_3 and an application management service AMS PSA 530_4 are shown in FIG. 1. It is understood, however, that system 10 may include more or fewer PSAs as shown by reference numeral 530_5. 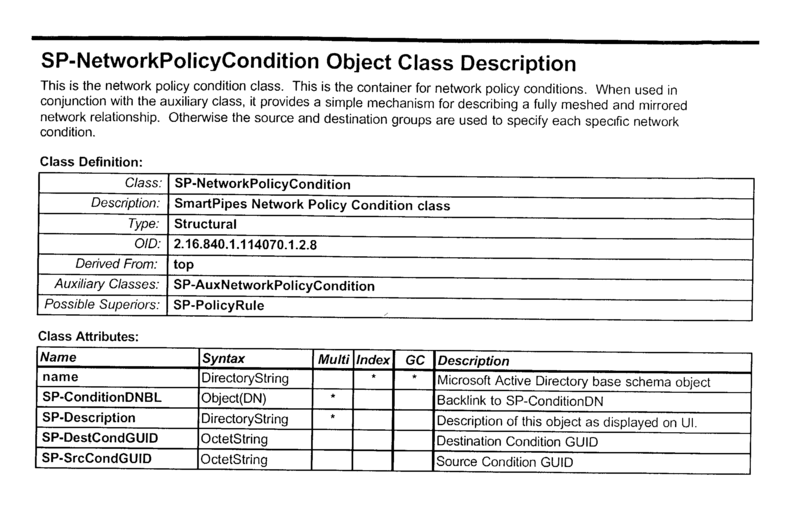 Each PSA  530, in cooperation with policy generator 520, evaluates a set of associated policy schema from directory 440, and generates a corresponding service-based device-neutral XML network policy in compliance with the deployed networking policies. Each PSA 530 is associated with a dedicated network service. For example, VPN PSA 530_1 is associated VPN-related services; similarly, firewall PSA 530_3 is associated with firewall services. Additional PSAs are optionally included in system 10 as the need for their respective services arises. Each of the PSAs have a number of common features, which will be described first. Following will be the individual features of each PSA. FIG. 6 illustrates in more detail the communication between the policy generator  520 and a PSA 530. Generator 520 provides a server address 532, a rule 533, and an XML template 534. PSA 530 accesses directory 440 as needed to populate the XML template. The XML template is returned as a populated template by 35 at the end of the process. 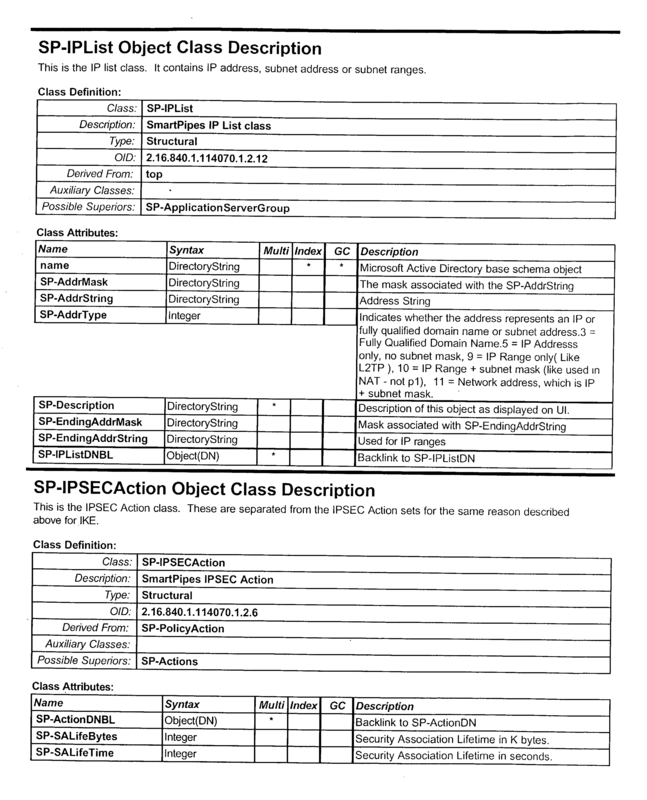 PSA 530 implements asynchronous method 536. A synchronous implementation 537 may be implemented as a special case of the asynchronous implementation. 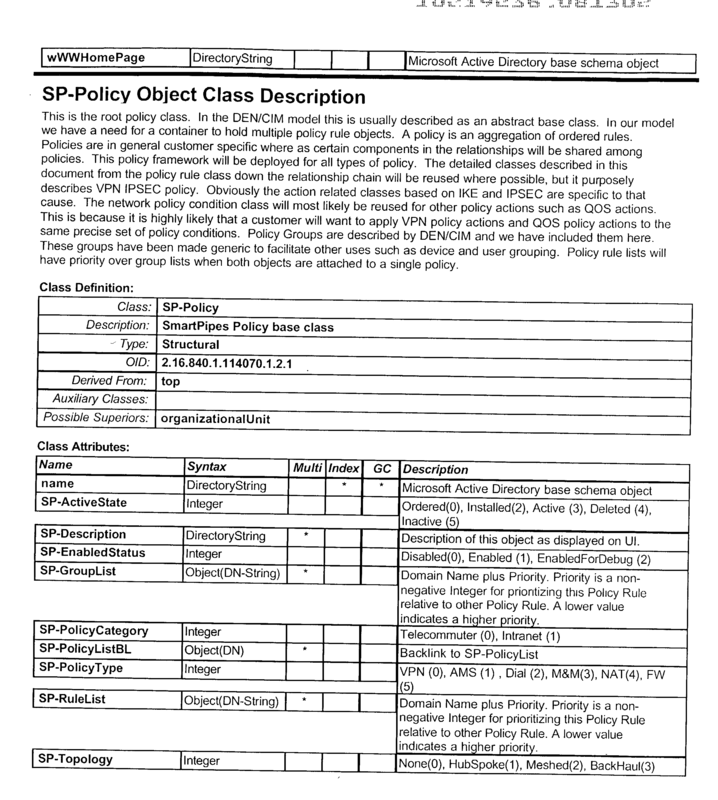 The ISPGeneratePolicy interface is defined by policy generator  420 as the common interface to all the PSAs and is implemented by the PSA framework. The ISPGeneratePolicy interface support rich error handling for all client applications. The ISPGeneratePolicy interface implements the GenerateXMLSchema routine causing policy generator  420 to request AMS policy generation. This interface is synchronous and blocks for completion of AMS policy generation. The implementation of the routine calls the asynchronous routine AsyncGeneratePolicy and blocks for completion of AMS policy generation. The parameters and a brief description of the ISPGeneratePolicy interface is provided in the table below. in the XML Policy document. 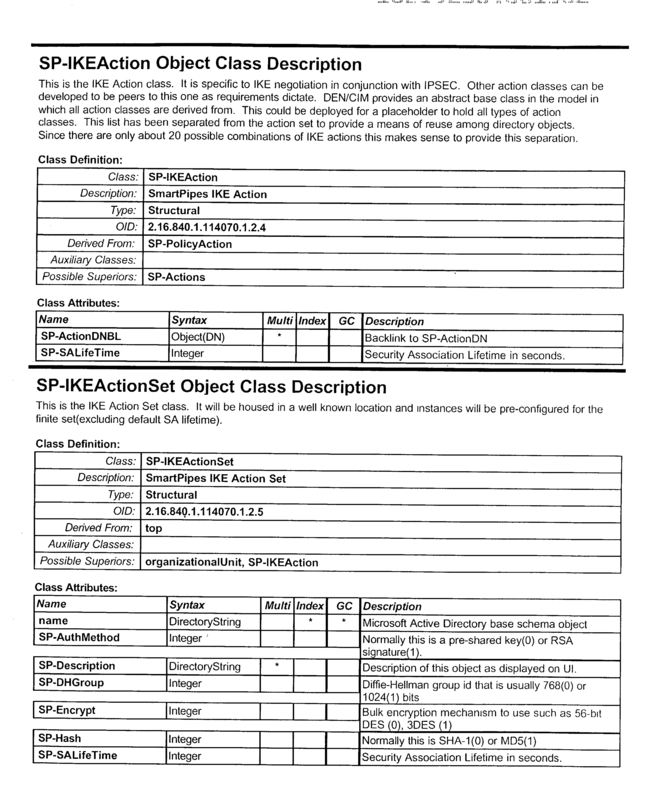 During the XML generation process, the PSA periodically checks to determine if policy generator  420 has requested the PSA to stop processing and to immediately return from the policy generation process; this is accomplished by querying the sychronize interface on the call instance for the ICancelMethodCalls interface and calling the TestCancel( ) routine. 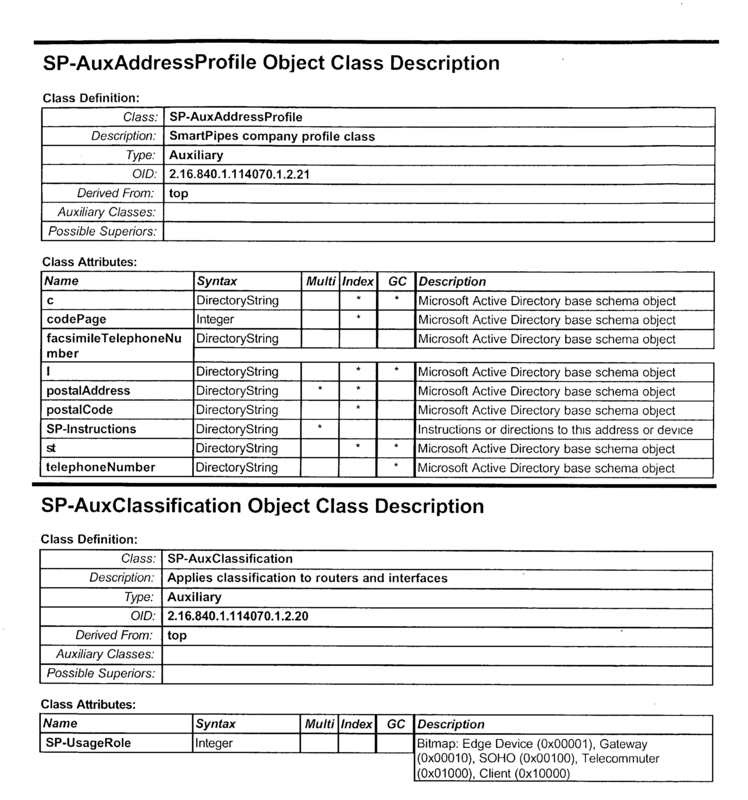 associated with a class instance. Each PSA is subordinate to the policy generator  520 and thus only performs as directed thereby. 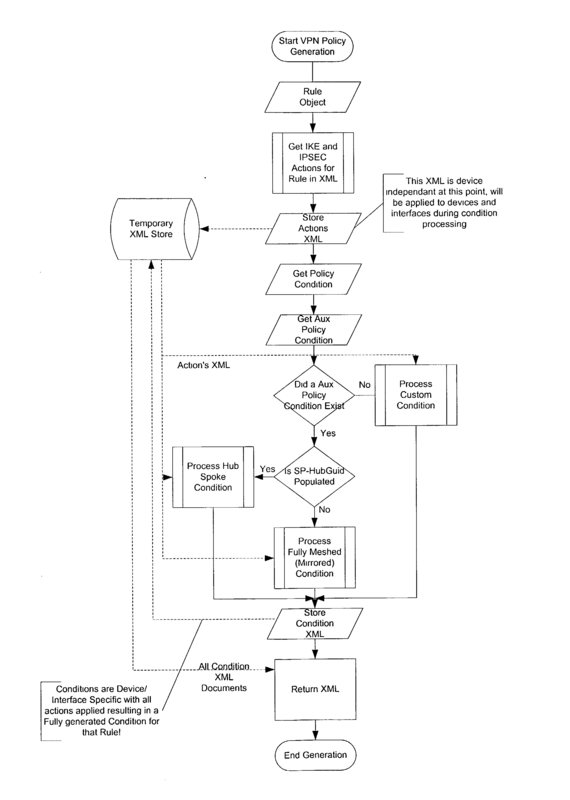 The Policy Generation Data Flow Diagram , attached as Appendix B, details interaction between the various processes within the VPN PSA. This design adheres to that flow. VPN PSA  530_1 communicates with policy generator 520 using a custom implementation of asynchronous COM method similar to those used by COM+ and Windows. VPN PSA 530_1 must first register with policy generator 520 to communicate therewith. Policy generator  420 creates instances of the PSA by using a Call Factory to generate an asynchronous interface. The PSA accesses and queries Active Directory  440 for all information needed to create a policy. The PSA accepts and uses the server that is passed thereto as a parameter from policy generator 420 to perform queries on. Since different instances of the PSA may access different servers at the same time, the servers are not stored as global static values within the PSAs. Virtual Private Network (VPN) PSA  530_1 enables a private connection of the user network over a shared public network, e.g., the internet. The VPN PSA interprets and generates Internet Key Exchange (IKE) and IPSEC-based policy information in directory 430 (IPSEC defines a set of protocols and cryptographic algorithms for creating secure IP traffic sessions between IPSEC gateways. The VPN PSA creates policy description on a per-device basis as XML data in a template provided by the policy generator. The template, as populated by the VPN PSA, is returned to the policy generator for storing in the policy store with other policies relating to that device. The VPN policy schema in the directory describes policy conditions such as Access Control Lists (ACL), and policy actions such as IKE settings, Authentication Header (AH) settings and Encapsulating Security Payload (ESP) settings. Each VPN PSA  530_1 includes a number of processes. Such processes include attaching actions to conditions as well as encoding the actions and conditions into XML based on the VPN Policy XML schema. There are three types of conditions within a rule that define the actions taken by the VPN PSA processes, namely Hub/Spoke, Fully Meshed, and Custom. The VPN Policy Schema defines such conditions using the Net Condition and Aux Net Condition schema objects and generate XML for all such three conditions. the directory BUT only generated per generation request! 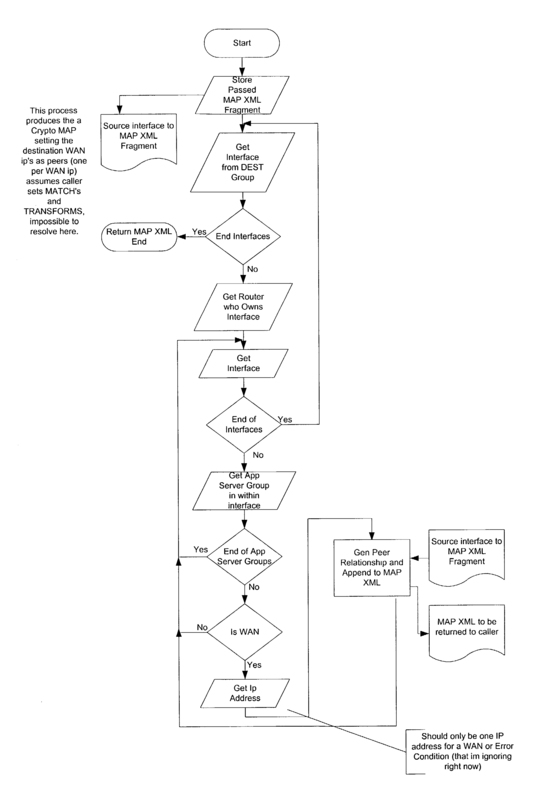 custom condition VPN XML policy (See Policy Schema ). 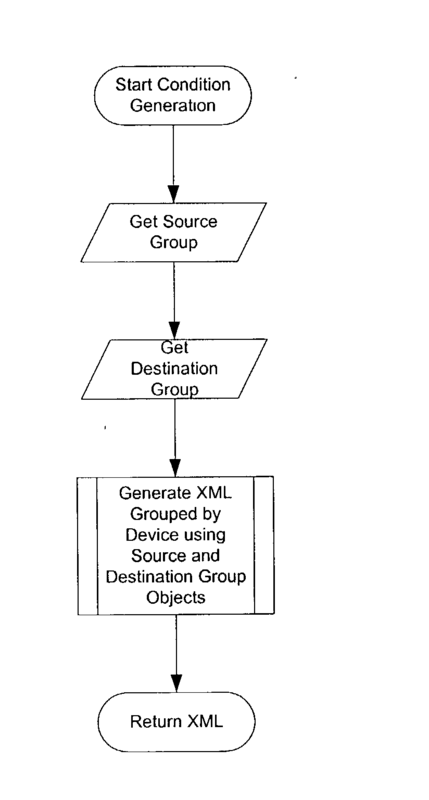 generate a Spoke and Hub set of XML device configurations. 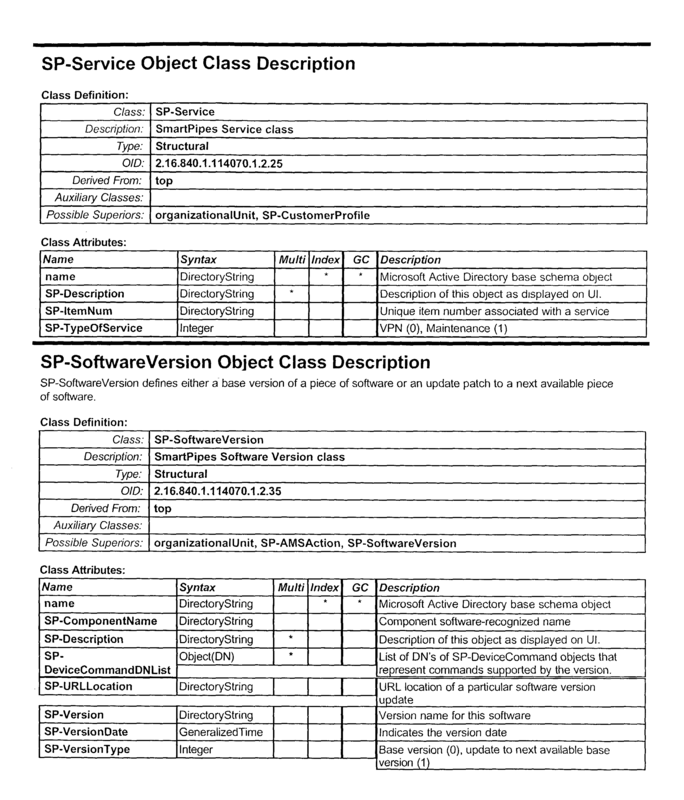 specific document to output document. ip address attached to the App Server Group. 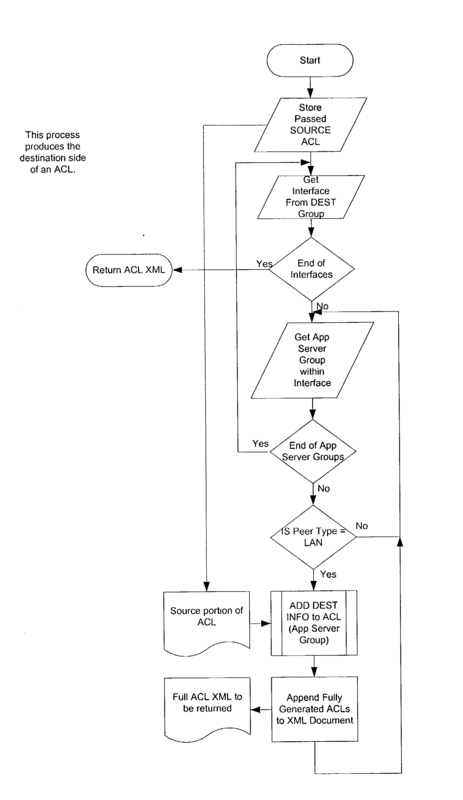 calls the ACL for App Server Group Process. the peer to append to returnable document. to the Device Document, applies any other actions as needed. A network address translation (NAT) PSA  530-2 provides policy for translating local (internal) IP network addresses to remote (external) IP addresses used by devices outside the internal network. 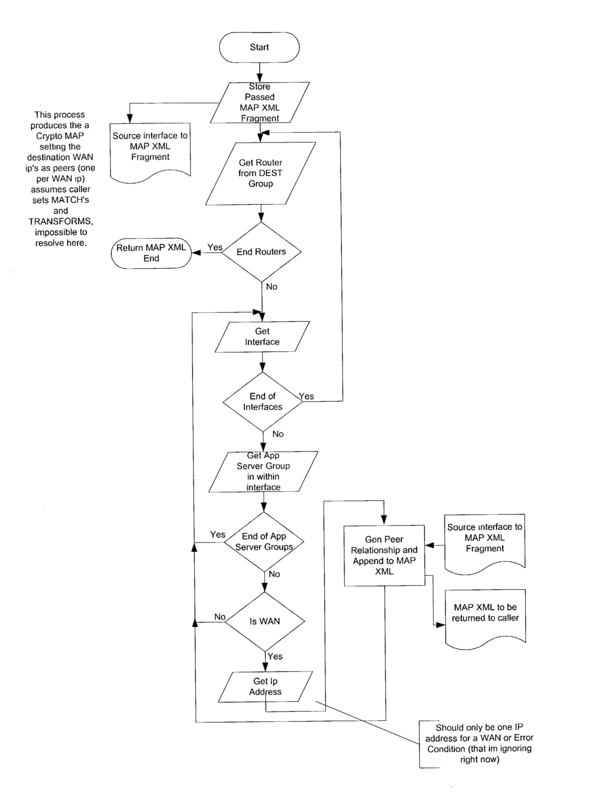 The NAT policy schema describes processing rules for passing traffic between external and internal IP addresses and translating traffic from one set of IP addresses to another. NAT PSA  530_2, in conjunction with policy generator 520, receive and evaluate NAT policy descriptions in policy schema of directory 440, and, in response, generate service-based device-neutral NAT policy data, and, thereafter, store the generated policy data in the NAT section of each associated managed device in policy store 430. The NAT policy schema in directory  440 establishes rules for transferring data between external and internal IP addresses and translating such data from one set of IP addresses to another. Firewall PSA  530-3 interprets and generates firewall policy from directory 440. The firewall policy schema contains information related to Context-Based Access Control (CBAC), denial-of-service hosting prevention, IP spoofing prevention, and Intrusion Detection (IDS). This information is optionally encoded as a set of firewall (templates) which may be used to select different settings of the above firewall features. Firewall PSA  530_3, in conjunction with policy generator 520, receive and evaluate firewall policy descriptions in policy schema of directory 440, and, in response, generate service-based device-neutral firewall policy data, and, thereafter, store the generated policy data in the firewall section of each associated managed device in policy store 430. IP Spoofing attacks often occur from outside of a trusted network by spoofing an IP packet with a source address from the trusted network. The best way to prevent this attack is to block all incoming traffic on the External Interface whose source IP address is that from the trusted network. Cisco Routers also have a feature called Unicast Reverse Path Forwarding (RPF). 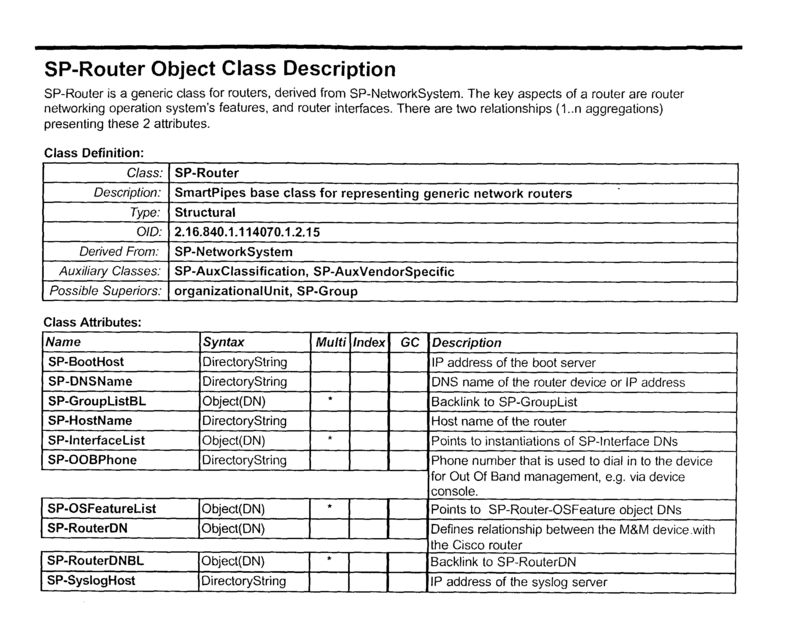 This feature checks each packet that is routed into router. 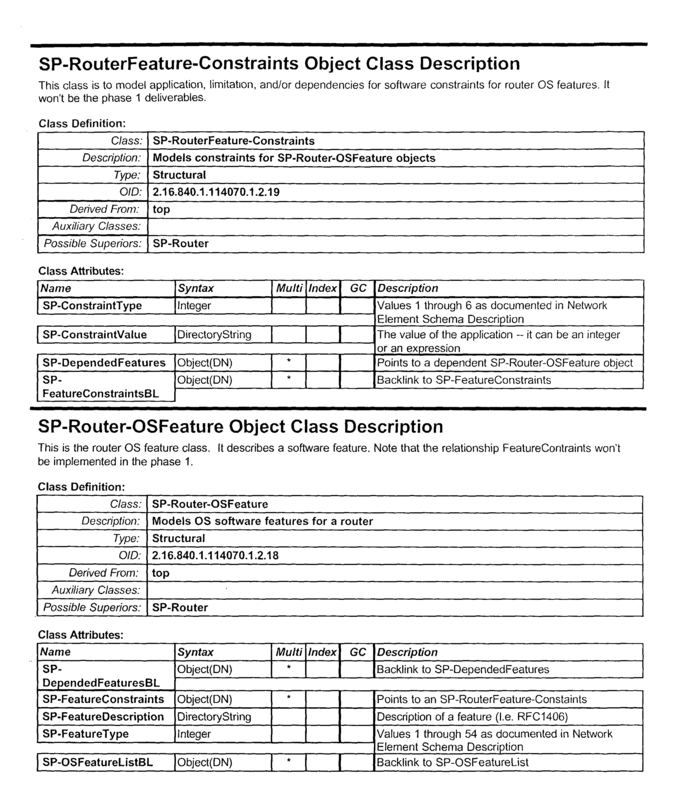 If the source IP address does not have a route in the CEF tables that points back to the same interface on which the packet arrived, the router drops the packet. Enabling this feature on the Router also prevents IP spoofing attacks. The Unicast RPF feature won't be used for Phase  1 as there are problems with this implementation in Cisco Routers. Application Management System (AMS) PSA  530-4 interprets and generates AMS policy from directory 440. 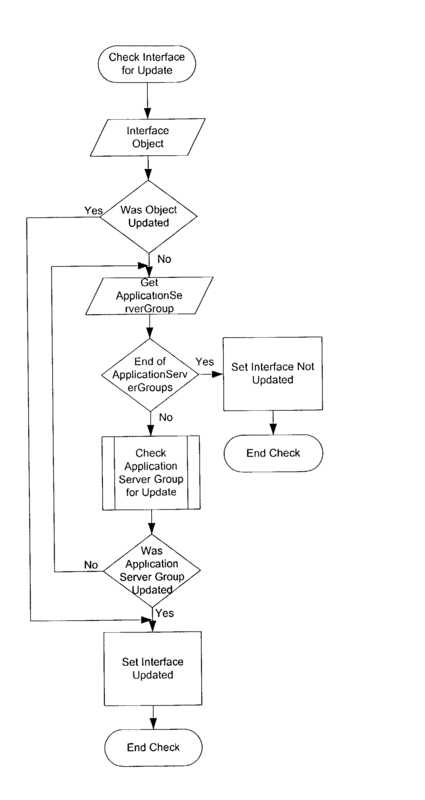 AMS allows users to organize application activities into hierarchical structures that support the execution start-up and shutdown of synchronized activities, based on user-defined policies. For example, an application activity can be executed, suspended, resumed and terminated. Activity states can be monitored. If an activity (or node) fails, several recovery policies can be applied. For instance, in case of node failure, an application can be restarted on an alternative node. 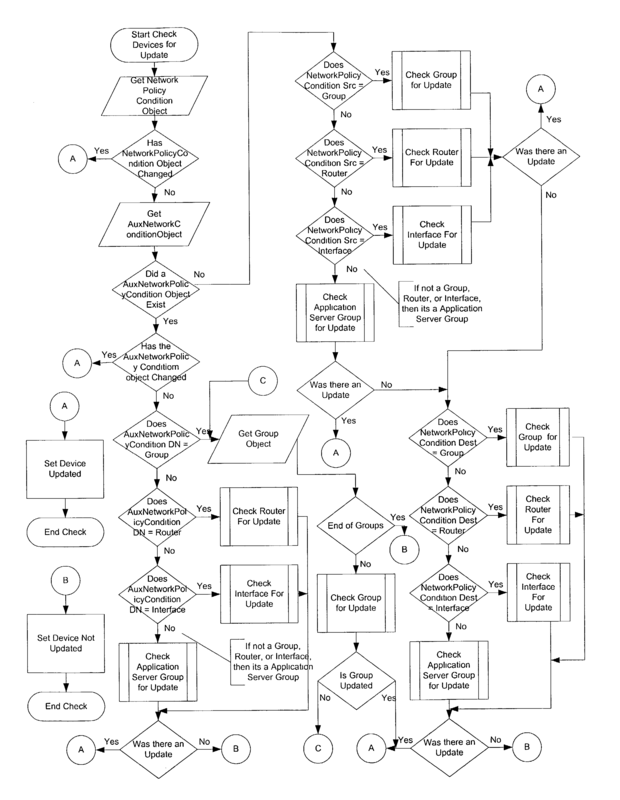 The AMS policy schema contains information related to software application policy, such as management device embedded software versioning and update information. 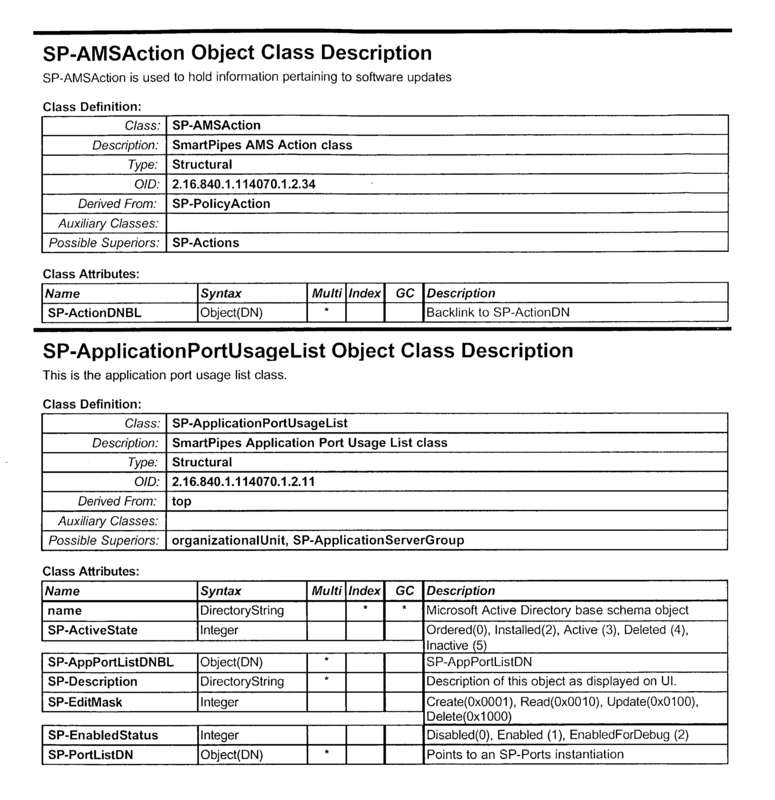 AMS PSA  530-4, in conjunction with policy generator 520, receive and evaluate AMS policy descriptions in policy schema of directory 440, and, in response, generate service-based device-neutral AMS policy data, and, thereafter, store the generated policy data in the AMS section of each associated managed device in policy store 430.
passed in the parameter list. objects of class type AMS. *pBaseSoftwareNode) by a parent software object. Policy fetcher  540 provides an interface between policy store 430 and the device plug-ins (DPI) 610 in layer 600. Policy fetcher 540 retrieves configurations and policy information of the managed devices from policy store 430 and supplies them to DPIs 610. After storing the new network policy for a managed device, policy generator  510 so notifies the managed device's associated device plug-in via event manager 36. Thereafter, policy fetcher 540 transfers the XML policy data to corresponding device plug-ins in device plug-in layer 600 which, in turn, translate the data to device-specific configuration data and deliver the translated data to their associated managed devices. Authentication/key manager  550 manages passwords and pre-shared authentication keys required to access the managed devices. Any module in system 10 (e.g., bulk loader 340 in layer 300 or Cisco DPI in layer 700) requiring access to a managed device, acquires the device's associated password or keys from authentication/key manager 550. In other words, authentication/key manager 550 has exclusive access to a managed device's security information—stored in policy store 430—and passes the security information to a module requesting such access. Authentication/key manager 550 supports both push-type devices—which are unable to request policy information and thus policies must be pushed onto them—as well as pull-type devices, that may request to receive a policy. Status tracking system  560 supplies policy store 430 and directory 440 with updates pertaining to base configuration data and policy deployment as well as password changes of the managed devices. Status tracking system  560 tracks the activities of policy generator 510 to ensure proper adoption of selected policies and configuration data by the managed devices. Assume, for example, that one of the managed devices is configured properly, but during the configuration of a second managed device, e.g. a power outage occurs. Status tracking system 560, tracks the configuration process and thus records the disruption due to the power outage for future correction. Because the service-based policy engine layer  500 is separated from the presentation layer 200 by the intermediate layers 300 and 400, in accordance with the present invention, users are insulated from enhancement/modification activities occurring in policy engine layer 500 and thus will not be subjected to any disruption as a result of system 10 enhancement/modification. For example, assume that additional network are desired to be added to those already under system 10's management. 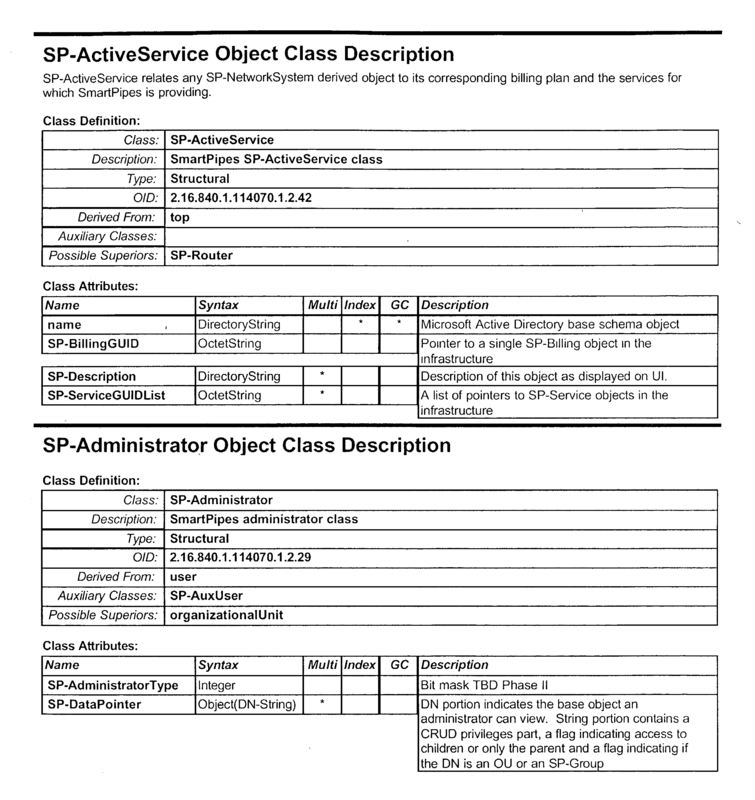 Such additions, which would require developing new PSAs and other supporting and related modules in the policy engine layer 500, are invisible to a system 10 user. The separation of policy engine layer 500 from the presentation layer 200 enables any enhancement in policy engine layer 500 to remain undisclosed to one or more users for a desired length of time when e.g. another user has entered into an exclusive use of that service. Policy deployment by policy generator  510 is carried out in three different ways. First, a user may, after selecting his/her desired work polices via the SAI 310, deploy the selected policies by pressing a submit button, in which case, policy generator 20 shortly thereafter begins to carry out its functions. Second, The user may store the selected policies, log in to the system at some future time to deploy the polices. 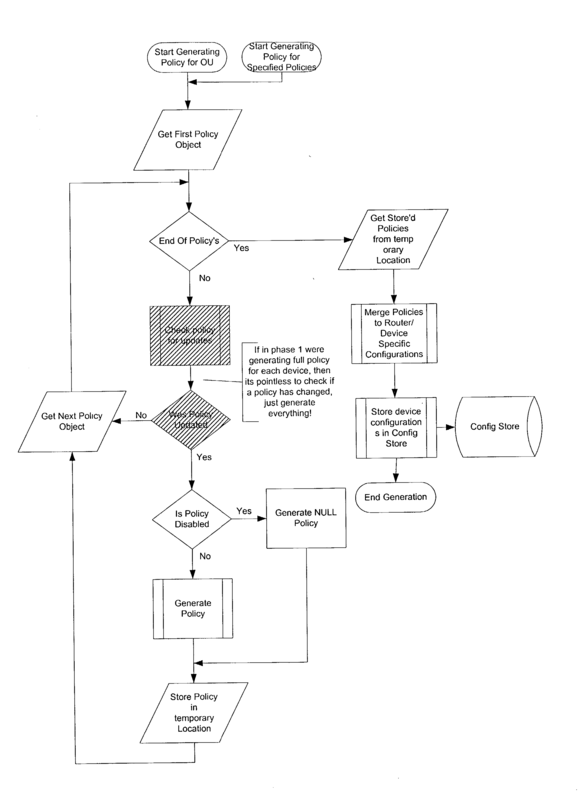 Third, a user may select and submit policies but request that the policy implementation be held in abeyance until such times as specified by the user. 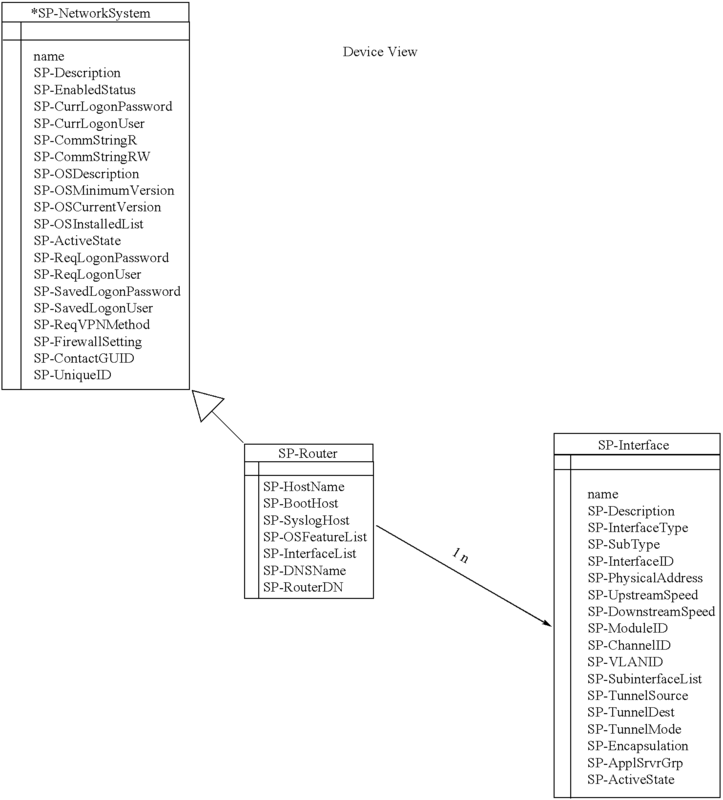 storing said flat file format device schema in a configuration database. concatenating together device implementations of a plurality of policies for said devices. providing each of said policy types to a specialized process for one of said policy types, said specialized processes generating a flat file for each device corresponding to said policy. 4. 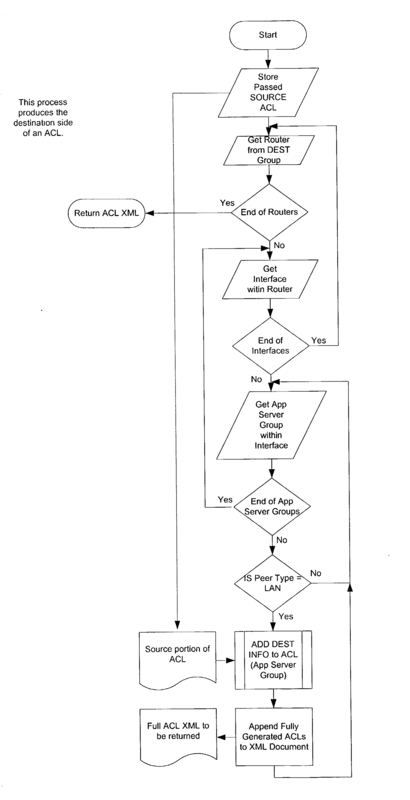 The method of claim 3 wherein said process is a COM server. 5. The method of claim 3 wherein said policy types include a virtual private network (VPN), a network address translation (NAT), a firewall and application management services (AMS). providing to said processes a server address for a server containing said directory. adding device attributes from said directory to said flat file. providing a policy generation thread pool comprised of threads generated by said main thread, each thread in said thread pool being responsible for policy for a particular policy object. managing passwords and encryption keys in an authorization/key manager separate from said COM servers, and responsive to calls from said COM servers, to provide consistent passwords and encryption keys. 11. The method of claim 9 wherein said flat file format is XML, and said concatenating is performed using an XSL stylesheet. 12. 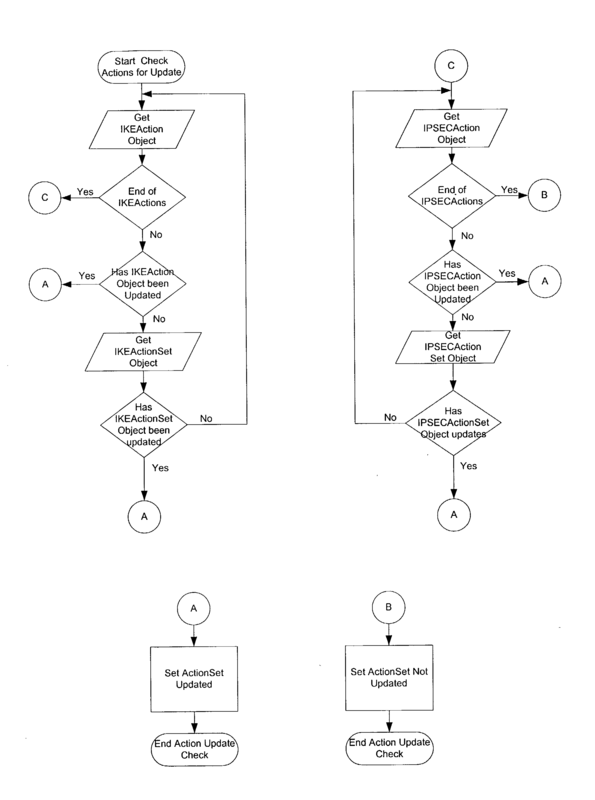 The method of claim 9 wherein said policy generator comprises multiple instantiations on multiple servers. storing said schema in said configuration database using an ADO object pool in communication with an OLEDB provider. providing at least one policy object for application of a policy to a plurality of said devices. 15. 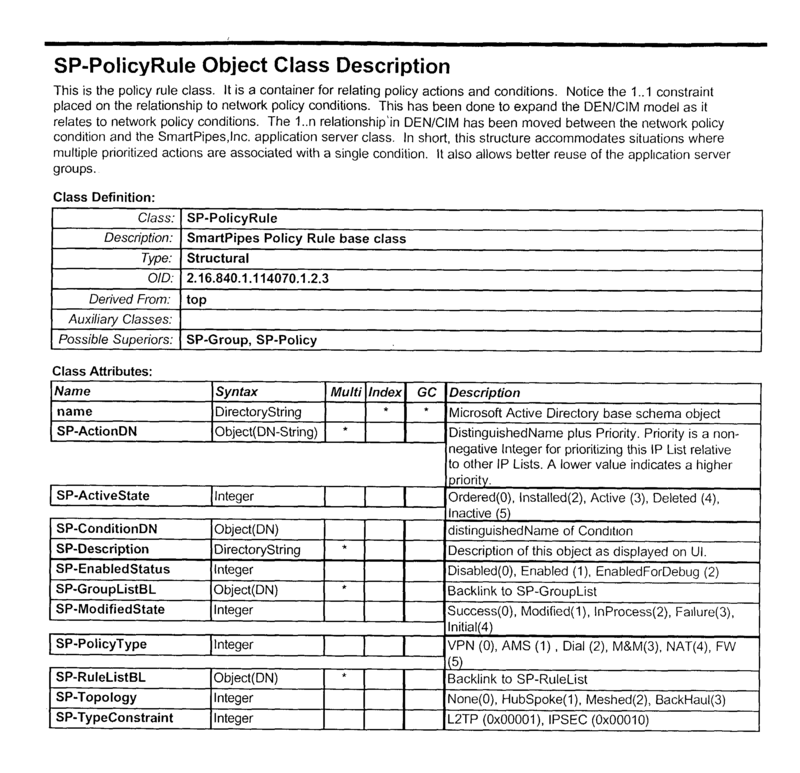 The method of claim 14 wherein said policy object is one of a plurality of policy objects including policy objects for security policy, firewall policy, network policy and router configuration. 17. 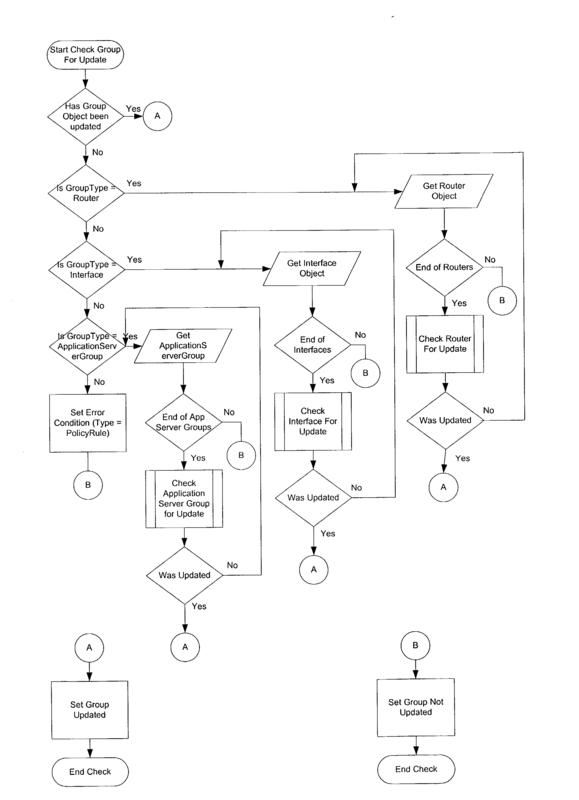 The method of claim 16 wherein each said specialized process is a COM server. 18. The method of claim 16 wherein said policy types include a virtual private network (VPN), a network address translation (NAT), a firewall and application management services (AMS). providing both synchronous and asynchronous implementations. a plurality of objects describing attributes of network policy. 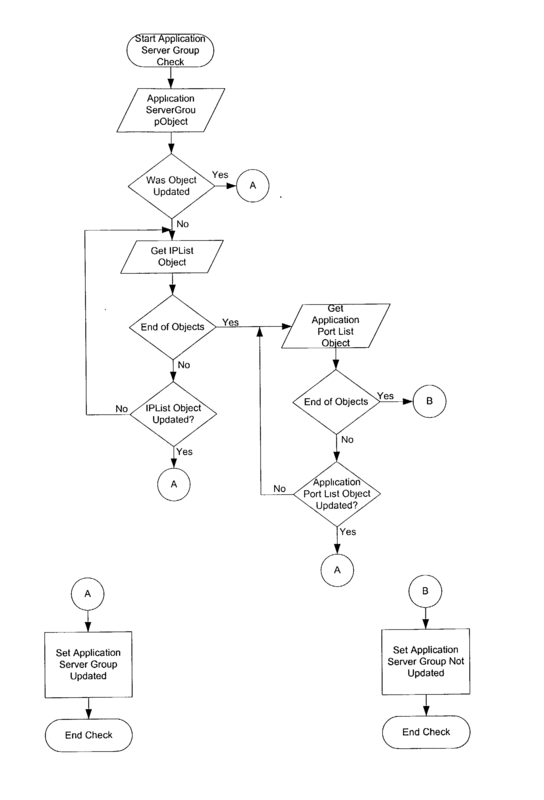 an application management system policy. 23. The media of claim 21 wherein at least one of said objects sets forth the connections in a network. 24. The media of claim 21 wherein at least one of said objects is an actions object with a list of actions, and the type of action. 25. The media of claim 21 wherein at least one of said objects is an interface object with an indication of type or location, and networking relevant information. returning a populated XML template to said policy generator. 27. The method of claim 26 wherein said policy generator is a COM server. 28. The method of claim 26 wherein said policy service agent includes an asynchronous COM interface with said policy generator.